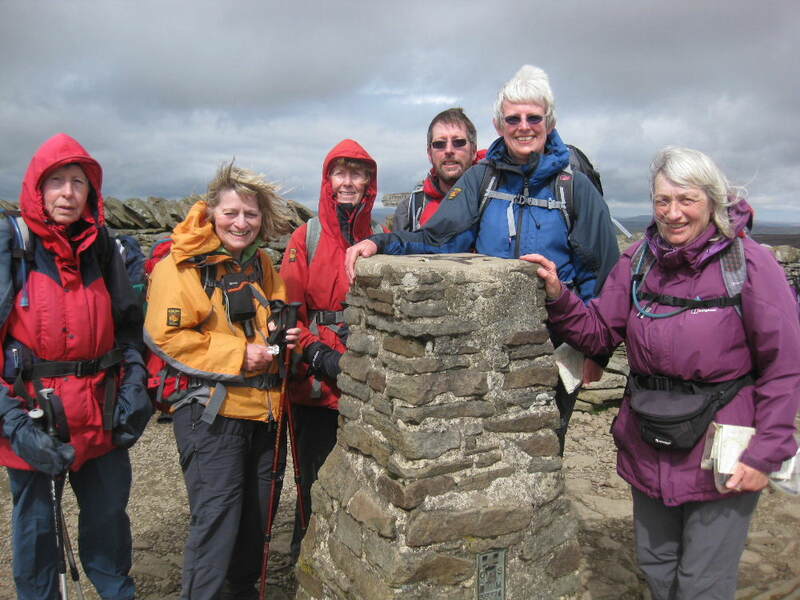 Chepstow Hill Walking Club - The Only Way is Up! Here is a complete record of all the Chepstow Hill Walking Club's walks since we were formed on 26 April 1977. Starting from the upper waterfalls car park to the west of Talybont Reservoir, we followed the road (and the Taff Trail) up and over the pass and dropped down to turn right, keeping on the Taff Trail to head towards the Neuadd Reservoirs. Instead of following the old byway, we stayed on the tarmac forking right to keep above the now roofless building - where we looked down to see how much of the old track that goes to the Upper Reservoir has now slipped away. Taking the second gate on the right – i.e. just after the stream - we followed the footpath/track up the true right bank of the stream to re-join the old 'Roman Road' having bypassed the point where the old road crosses the stream. After another kilometre, we stopped for coffee overlooking the empty Upper Neudd Reservoir - trying to remember if we had ever seen water there to match the expanse shown on the maps. Suitably refreshed after coffee, we continued to 'The Gap' (Bwlch ar y Fan), where we turned right (East) for the one steep climb of the day - up to the 'Diving Board' and plaque at the summit of Fan y Big. Now exposed to the biting NE wind, we turned south to follow the edge of the escarpment round. We stopped for lunch in a well-sheltered sun-trap next to the enormous cairn where the otherwise-unmarked Beacons Way leaves the escarpment. Some time later we resumed our journey around the edge of the escarpment - constantly distracted by the impressive views north, and the uneven snow lying in the path. Reaching the path junction before Rhiw Bwlch y Ddwyallt, we turned right (South) again towards Craig y Fan Ddu. Halfway along this path, we were surprised to see an enterprising group (with large rucksacks) struggling up the steep grassy slope - presumably from the bottom of the valley. We can only assume this was some training exercise.... We then crossed the stream above the waterfall (where the Beacons Way re-joins), before starting our descent which brought us straight back to the car park. Staying at The Mid Wales Bunkhouse between Llanidloes and Rhayaderafter - after enjoying the excellent facilities in the nearby (but not within walking distance) Mid Wales Inn and taking advantage of 'spare cars', we completed two linear walks primarily following the Glyndwr’s Way (named in honour of Owain Glyndwr, the last Welsh Prince of Wales). Starting from the Wynford Vaughan-Thomas memorial on the mountain road between the B4518 and Machynlleth, we followed the route of the Glaslyn & Bugeilyn Audio Trail, stopping frequently to benefit from the recording. The route initially descends following a byway, before climbing very steeply to the 564m trig point at Foel Fadian – the highest point on the Glyndwr’s Way. It then skirts the Afon Dulas gorge and leads to the edge of the Glaslyn lake (an excellent spot for coffee). We continued around the lake, detouring for another view over the Afon Dulas gorge (sadly we didn't spot the peregrines) before enjoying an extended lunch stop in the warm sunshine above Nant Dduand and then headed east to the (disused) Roman Fortlet. We then kept to the Glyndwr’s Way until we reached the car park at the western end of Llyn Clywedog. A quick car-shuffle and we returned to the bunk house. Taking advantage of non-walking drivers, we shuffled cars before the walk (leaving the cars in Llandiloes), to start walking from the Pen-y-rhynau car park about half way along the southern shore of Llyn Clywedog. We then followed the Glyndwr’s Way all the way back to our cars - although we did detour to Pen-y-gaer hill fort (another excellent sun-trap for coffee). We also paused below the dam to view the site of the Bryntail lead mine workings and we enjoyed lunch on a footpath near Penclun, overlooking Llyn y Fan and several former chimneys. Sadly, although clearly marked on our maps, there was little sign of the path through the fields, so we had to retrace our steps and return to the Glyndwr’s Way route. The final section of the route crossed the golf course, and then followed the Severn Way into the centre of Llandiloes - where our transport awaited. Having left the cars just off the A433 the first stretch was walking along the road to Tarlton into a very strong headwind. From Tarlton we headed north to Hailey Wood through a very brief hail shower, we were pleased to reach the shelter of the trees and stopped for coffee at 'The Star'. Continuing north as we left the woods we crossed under the railway and over the A419 before reaching the three stone-walled structures at Cassey Well, none of which had any water in them. We were now on top of the Sapperton Canal Tunnel and could see the tree covered mounds of earth brought up from the tunnel construction shafts. We then turned to head south-east so that for the next stretch of road the wind was at our backs. 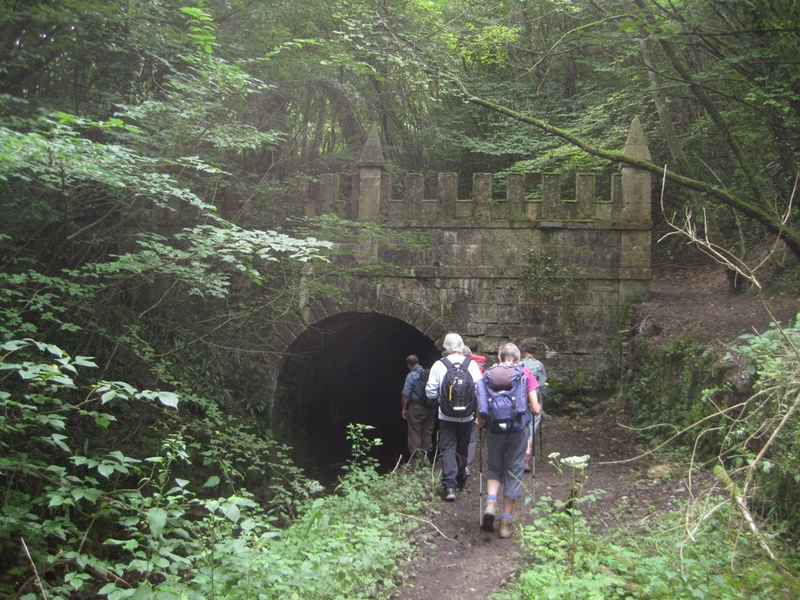 Having walked through another part of Hailey Wood we reached the canal tunnel portal where we stopped for lunch. Our route now followed the canal, past the round-house and under the skew railway bridge with its impressive brickwork. At the next bridge we turned south to find the stone marking the nominal source of the River Thames - though there was no sign of any water here. Continuing along the course of the river we re-crossed the A433 and eventually came alongside the first section of the river to be flowing above ground as we neared Kemble. Turning west we then returned to the road and our cars. Eight walkers arrived in Llanvihangel Crucorney in very dense fog but as we crossed the railway line and headed upwards to Great Llwygy we emerged into the bright sunshine which we then enjoyed for the rest of the day. Walking over the fields to Cwmyoy we enjoyed coffee on the hillside before reaching the ‘wonky’ church there. From the church a steep climb brought us to Hatterall Hill where we lunched enjoying the somewhat hazy but stunning scenery. On reaching The Offa’s Dyke Path we turned south walking the ridge and descending to fields before walking by the river Monnow to reach Llanvihangel Crucorney once more. We parked by the view point on the side of Cleeve Hill and walked anticlockwise round the bottom of the hill before climbing up to the aerials. We found a coffee stop sheltered from the wind by a large clump of gorse bushes. We followed the Cotswold Way to Belas Knap which is an ancient burial mound and is over 5,000 years old. It was then a steep descent to the road and across fields to the outskirts of Winchcombe. Lunch was taken in a field within sight and sound of the church clock with a golden cockerel as a wind vane. 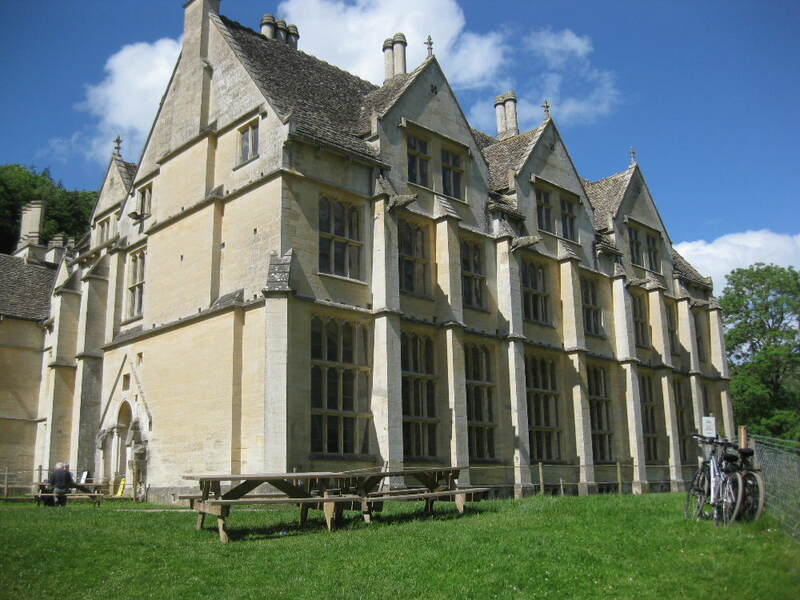 In the afternoon we walked around Polstlip Paper Mill and then around Postlip Hall a lovely old Cotswold Manor House. It was then a short way along the side of the golf course to complete the circuit of Cleeve Hill in a warm but windy day. Thank you to Claire for letting us have the left over scrummy cup cakes from last night’s New Year get together. A satisfying way to finish a good walk. The walk started in Monmouth going past Troy House, a 17th century grand house, now empty and awaiting it's fate. A steady climb took us to Penalt old church where we had coffee, overlooking the splendours of the Wye Valley. We then dropped down to the river, crossing the disused railway bridge into Redbrook. Now following Offa's Dyke path we climbed again eventually coming to the view point over looking Monmouth and the mountains. We inspected the naval temple, a memorial to sixteen admirals including Nelson, before a steady down hill to the River Wye and into Monmouth. This being Remembrance Sunday, we visit a World War Two aircraft wreck site to pay our respects to the fallen of all conflicts. After a dismal and stormy start to the day the skies cleared as we reached the car park at Dover’s Hill near Chipping Campden. The aircraft wreck site we were visiting today was on Broadway Hill, Worcestershire. A plaque commemorates the crashing onto the hill of a Whitley Bomber in 1943 with the loss of all crew members. After a stop for coffee near Broadway Tower we walked south for a while on the road to Seven Wells Farm then walking through the very colourful woodlands nearby before crossing the A44 to take lunch near Upper Wold Farm. Walking over open farm land we reached Broad Campden, the village being bathed in sunlight showing off the honey-coloured stone cottages to perfection. We then walked on to Chipping Campden visiting the feature that marks the northern end of the Cotswold Way and lingering in the town to admire the 400 year old market hall and the many picturesque buildings. From Chipping Campden we followed the Cotswold Way back to Dover’s Hill. With a very strong north to northeast wind blowing, we set off up the track to Grwyne Fawr reservoir. We went on to the bridge over the reservoir to admire the lovely autumn colours with the water in the foreground. Following our coffee stop we went on the escarpment where there was a lot of evidence of repairing the path. We then walked round the circle of Y Das to find a spot for lunch where it wasn’t so windy. The climb up to Waun Fach warmed us up after lunch. It was forecast to be -10 degrees on the summit. We didn’t think it was quite that cold but cold enough not to hang around too long. The path from Waun Fach to Pen y Gadair used to be a dreadful slog up and down peat hags and jumping over streams, but now it is a lovely made up winding path and the distance is covered in half the time. After a brief summit appreciation we descended sharply down to cross the two streams at the bottom and so back to the cars. We returned to the excellent Eastern Slade Barn bunkhouse, intending to complete the walks originally planned for our visit in October 2017 when storm Brian caused a slight change to our itinerary. The winds abated by Sunday morning and the expected rain never materialised, leaving us with a beautiful sunny afternoon. A weather shortened walk, from the bunkhouse down to the wind-swept sea-shore, which we followed as far as Oxwich point, before returning (via the trig point) to take a quick look at Oxwich castle and thence along the lane back to the bunkhouse. Starting from the car park about 500m North of Penrice (at the end of the drive to Penrice Castle), we followed the drive North East, past the house and the stone mushroom tree. Continuing North and then East, we reached the A4118, which we followed East and then turned South to descend towards Oxwich. We then turned East through Nicholaston Woods to Nicholaston Farm, where we found notification of an 'Extinguished Footpath'. We re-joined the South Wales Coast Path and stopped for coffee overlooking Nicholaston Burrows and Oxwich bay. We continued East to observe and pass, but not necessarily cross the stepping stones, before following the river North to join the old road, just south of its more modern replacement. We followed the old road towards North Hills Farm, and continued in the same direction, carefully crossing the A4118, to reach the eastern end of Cefn Bryn. Benefiting from some local knowledge, we climbed for about 10 minutes, to reach a perfect lunch spot overlooking Three Castles Bay and Oxwich with distant views of the Somerset/Devon coastline Lundy Island. Note to readers - large, oceangoing ships sometimes move, to give a different perspective/position. After lunch, we continued along the ridge (almost, but not quite, missing the sunken trig pillar) to reach the topograph where we detoured to Arthur's Stone and the days second trig point, before returning to the topograph and then heading South via Little Reynoldston and Kittle Top to return to the cars. 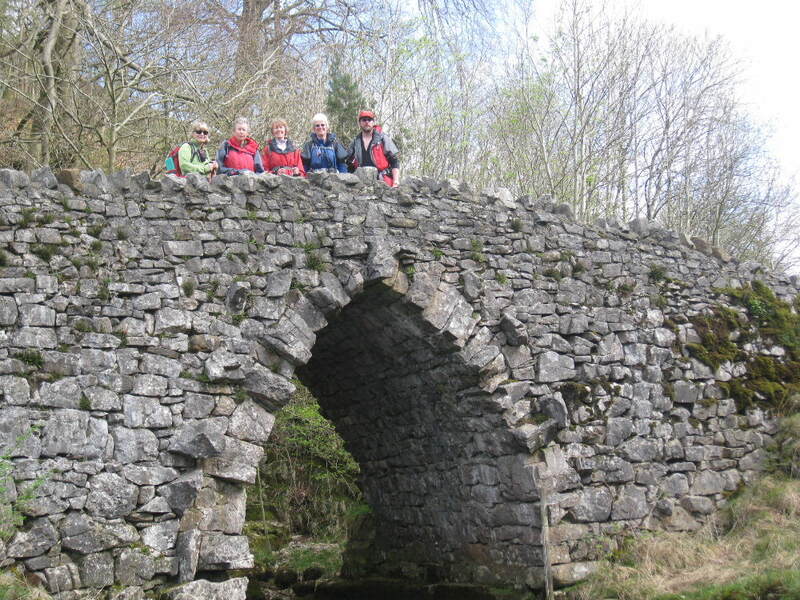 Staying at Kirkby Stephen Hostel, we enjoyed 4 walks in varying weather, in the surrounding countryside. Parking in the centre of Leyburn, we headed west onto the Shawl and continued west to Preston-under-Scar, where we turned south to cross the railway line. We continued South to Bolton Hall where we turned East to Wensley (where the walk can easily be shortened by heading North East to return to Leyburn). Our route crossed the River Ure and continued South to climb up to Middleham Low Moor (and its trig point), and then drop back down into Middleham. After a detour to look at the more obvious local highlights (Castle, Market Square and Church), we headed back North-West to return to Leyburn (recrossing the River Ure and the railway). Parking near The Thrang, we headed West and South, crossing the River Eden and then the railway line. We climbed (West and then South) to reach The Nab, where we found a sheltered spot for coffee-stop. We then continue to the 'resting' Trig Point before turning back South-East to the numerous cairns overlooking Mallerstang Common. We headed West and then South, before turning South-East, over Swarth Fell, to another cairn where we turned left (East) to descend to the road. We re-crossed the railway and then the River Eden, before heading North (with a choice of footpath or bridleway), to reach the road and cross the River Eden again, twice (no railway crossing either time), before returning to the cars. 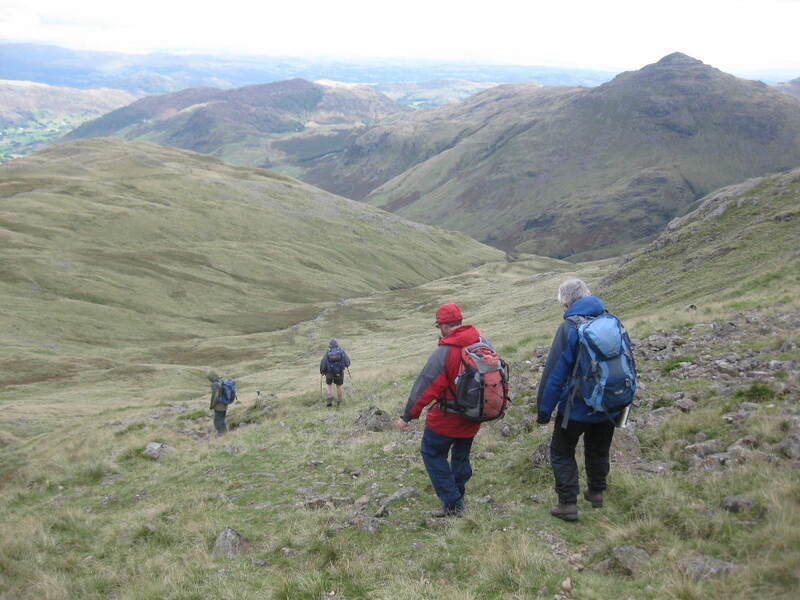 A linear walk from Dufton to Murton, via High Cup Nick and Murton Pike. Starting from the A685, near Kelleth (very limited parking), we headed East and then turned right (South), initially following the line of Bowderdale before climbing the ridge to reach West Fell and then Hazelgill Knott. The long ridge continued South, gradually climbing, until we reached the summit trig on The Calf in the mist and rain. We turned right (North-West) to follow an undulating ridge to Breaks Head where we found a sheltered spot for lunch (at the top of the last climb), before turning right (North-East) to follow the ridge towards Docker Knott (which we bypassed), and down to Blakethwaite Bottom (sadly we failed to identify Blakethwaite Stone). We then followed Uldale Beck (North), eventually climbing to Uldale End, and thence to reach the road at Longdale which we followed back to the cars. Another day without railways and only shallow streams to cross - at least we had another trig point. Unfortunately the advertised walk in Oxfordshire had to be cancelled. A repeat of a previous walk for some of the group, but a first for two relatively new members. Starting from a small parking area alongside the Monmouthshire and Brecon Canal at Llangynidr, the group crossed over the canal bridge and continued up alongside the Coach and Horses public house to follow the Afon Crawnon for a short distance. Whilst passing across several fields, we encountered a group of local farmers practising their horn-blowing and verbal commands with a large group of hounds, which was quite entertaining. After crossing through the yard of Llwyn-deri Farm, we continued uphill on a track towards Tyle bach cottage and finally up onto open countryside with views beginning to open out across the Dyffryn Crawnon Valley, Following this we made our way across and up through a large area of bracken which was quite hard work. Once we had cleared this and reached slightly higher more open ground, it was time to relax, have coffee and admire the views around us. 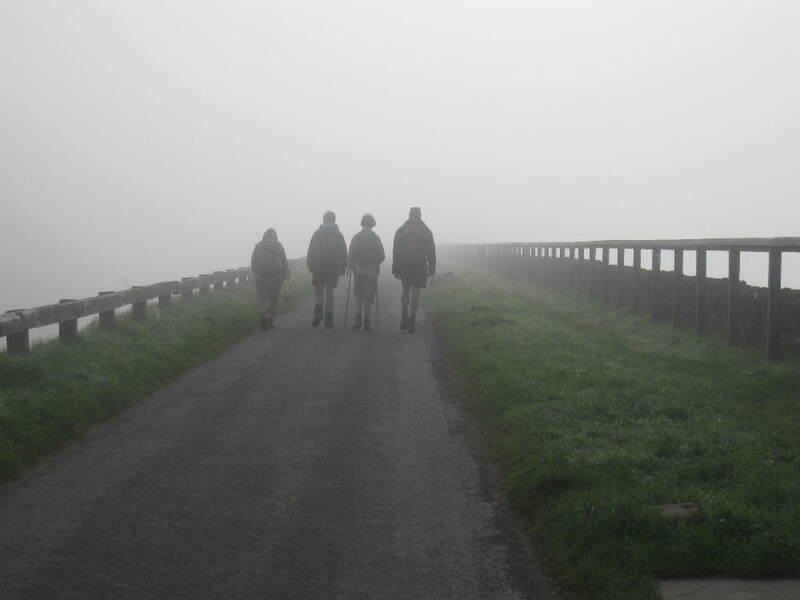 When we started out on the walk, it was quite a bright morning with the promise of possibly more sun to come but, unfortunately, as we continued after our break a heavy mist came down and the views disappeared making navigation a lot more difficult than it had been earlier. We did catch a glimpse of mother and foal finding their way through the mist - it was a pity none of us were "horse whisperers" we may have been able to ask for directions. Arriving at Cwm Pyrgad, we left the mist behind and descended through forestry, past the waterfalls to the head of the base of the valley from where we almost immediately began the ascent back up again onto the opposite ridge which overlooks Talybont Reservoir. The climb was difficult in places as it had become very over-grown due to the paths being closed for forestry work, but new way-markers had been displayed which was very encouraging. Arriving at the top of the ridge, the weather was beginning to brighten so we were able to look back and admire the length and breadth of the very beautiful valley. We then joined the Brinore Tramroad which provided easy walking and marvellous views of Talybont Reservoir below us and Tor y Foel mountain towering straight ahead. At the foot of Tor y Foel, we joined the Beacons Way and started our descent back down the valley with pleasant walking through fields and woodland areas and again lovely views of the valley but in the opposite direction. Crossing through one farm we encountered two baby goats and a puppy - all very endearing, but we also encountered a broken stile attached to a very wobbly fence which was extremely difficult to negotiate. Once over, we continued downward through fields until we reached the canal where we spent a few minutes watching people manoeuvre their canal boat through the loch. After a few minutes walk in bright sunshine along the canal, we arrived back at the cars and were amused to see a canal boat that passed by decorated out in celebration of the female passenger's 40th birthday. Having parked in Portishead, we caught the first bus of the morning to Clevedon to return via the coastal path. After several weeks of hot weather with no rain, the forecast for the day was giving a yellow warning for wind and rain; but we were very lucky, having only a few light showers - although we could see dark clouds over South Wales. Alighting from the bus at Salthouse Fields on the south side of Clevedon; we first followed Poet's Walk around Wain's Hill, visiting the Lookout before walking to the town around the Marine Lake. Coffee stop was in a shelter on the seafront. Passing the Pier, we then joined the coast path towards Portishead, finding a grass clearing overlooking the coast of Wales for lunch. On the approach to Portishead we walked through the National Trust woodland at Redcliff Bay before reaching the lighthouse with a view back to the old National Nautical School. At the Lake Grounds we enjoyed an ice cream before passing the Lido and walking over Battery Point. We then continued to the Marina area with the new apartment buildings surrounding the old dock. We crossed the lock gates and then admired the various sculptures on our return to the Town Centre, where the floral display was very impressive. The annual CHWC walk and BBQ. A short walk around the Avon Valley in East Bristol, followed by a BBQ. 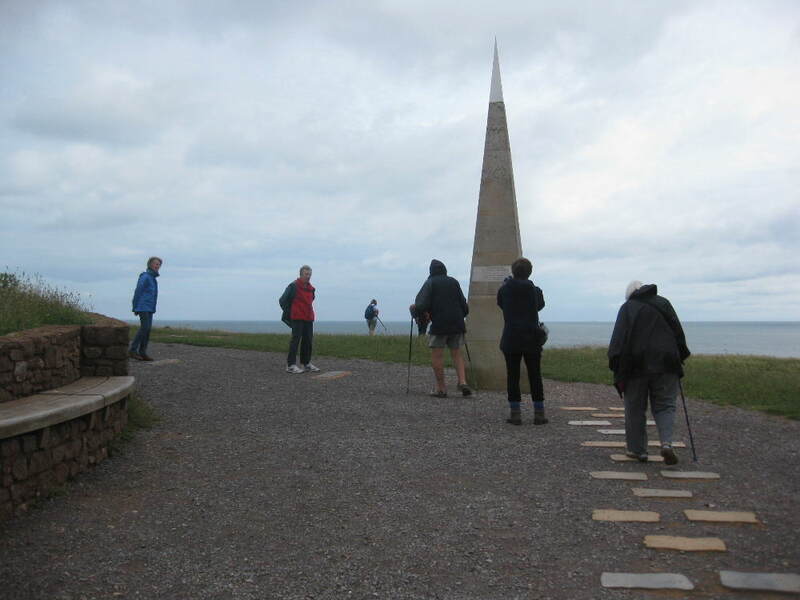 The walk included Panorama Walk and its recently installed view point. We also visited Dundridge Park, including a look at the new pond. At the BBQ, we recreated a photo taken in 2001 at Beer. 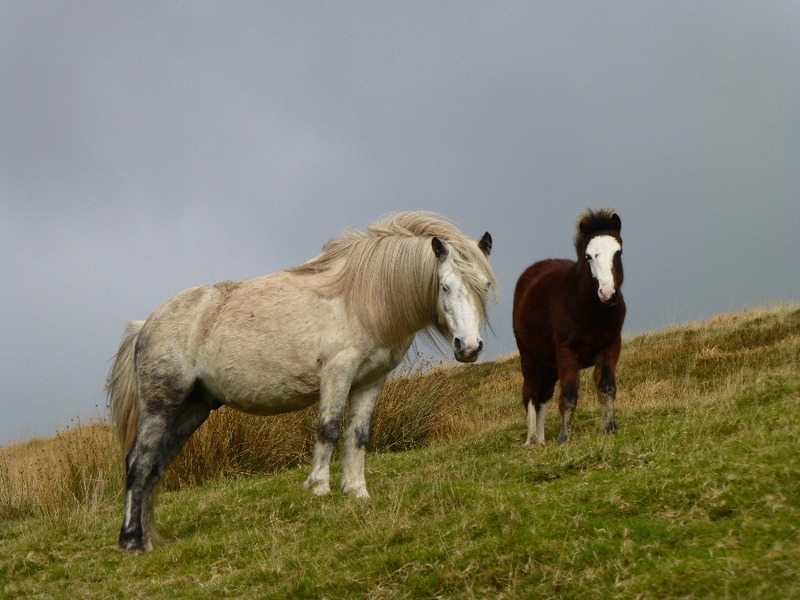 The Quantock hills have a special beauty in the variety of scenery and the far-reaching views one encounters on any walk in the area. Starting near the village bowling green in Holford we walked up Holford Coomb and Lady’s Coomb around the perimeter of the iron age Dowsborough Hill Fort to reach a minor road. Crossing the road the the walking became easier as we made our way through the woodland and then went steeply downhill to Ram’s Coombe. Carrying on down Ram’s Coomb we started climbing again at the car park at the bottom of Quantock Coomb. After a stiff climb we reached the Triscombe Stone, an ancient marker on the Drove Road. The Drove Road at this point is a lovely avenue of layered beech trees and stone walls. The next point of interest was Black Hill, the highest point of the day at 368m. Walking over the moorland we soon reached Beacon Hill with views over the Bristol Channel, the River Parrot and Hinckley power station. We then followed the Great Road into Holford via the memorial remembering the residents of Holford and Kilve that served in the Second World War. 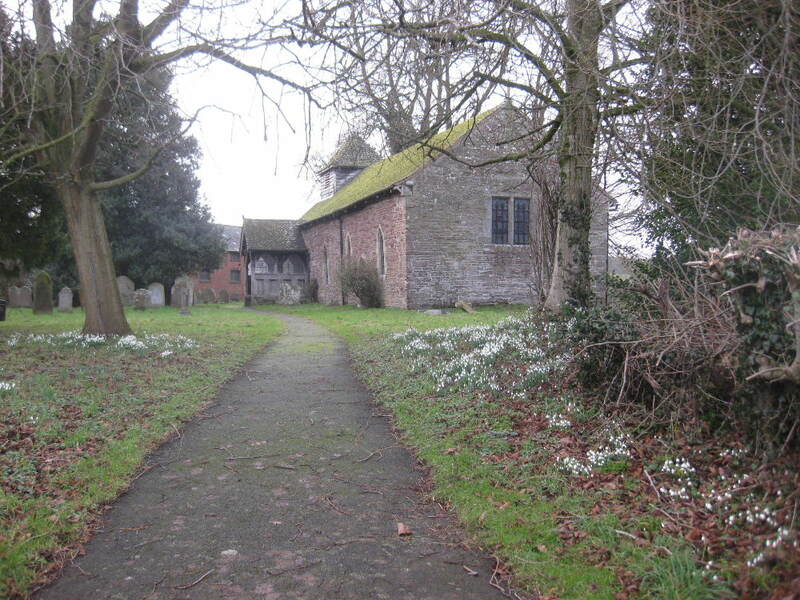 The last point of interest was the Alfoxton Dog Pound a listed structure probably from 16th/17th century donated to the village of Holford by the descendants of the St. Albyn family. From the dog pound an easy stroll downhill brought us back to the bowling green and the car park. Leaving the South Downs Bunkhouse (our excellent accommodation for the weekend), we retraced our route towards The Bridge Inn, Houghton (our excellent catering for Friday night - booking recommended). Part-way over the bridge we turned South, to follow the left bank of the River Arun. Leaving the river, we followed the road towards North Stoke before continuing South across the Gurkha Suspension Bridge, and thence to South Stoke, where we turned West to follow the right bank of the river before entering Arundel Park. A short climb was rewarded by excellent views back to the north and east, and a coffee stop to enjoy them. Continuing south, we dropped down and then regained the height to reach the strangely-shaped Hiorne Tower and the unusually relocated column cap. Our route took us towards the centre of Arundel, past the Cathedral where we detoured to briefly look at the powerful 'There But Not There" exhibition. Continuing through the town past the Castle, we reached the river and settled down for an extended lunch (ice-cream excellent, but optional). After lunch we crossed the river and turned east to follow the left bank upstream - excellent views of the Castle and a family of swans. We crossed the railway and continued north - fortunately unaffected by any of the (temporary) footpath closures. We avoided Jacob's Ladder and continued tracking the river, before forking right to follow a less distinct footpath around fields which brought us back to a clearer bridleway, heading north-east. We left the bridleway, turning right, to climb steeply (on uneven steps) towards Peppering High Barn. Rejoining the bridleway, after an official "Apple Stop", we turned north to reach Downs Farm (note the numerous orchids and the descent towards the unmapped dew-pond). At Downs Farm we encountered our first Centurian South Downs 100 runner and then saw many more as we dropped down towards Amberley Station - while we were nearing the end of our day walk, they were at the half-way point of their 30 hour challenge. From Amberley Station, we (reluctantly) walked past the Bridge Inn, crossed the bridge and climbed back up to the bunkhouse. Bignor, with its Roman Villa, is a short drive from the Bunkhouse; high above Bignor (on the aptly named Roman Road) is a car park and an unusual finger-post (where else will you see signs to Londinium and Noviomagus ?). Starting from the car park, we headed north-east (following the South Downs Way towards Houghton) to reach the curious Toby Stone, where we started our descent via Egg Bottom Coppice and the now-bendy Roman Road back into Bignor. After a quick tour of Bignor (saving the Villa for later) we followed the West Sussex Litterary Trail towards Sutton - stopping for a well-deserved coffee-stop part-way up the (small) climb. From Sutton we headed southwest, passing a small helicopter, to reach Glatting Farm. Our route now took us up towards the two masts on Glatting Beacon, courtesy of a well-shaded bridleway up through the trees and then an open meadow. Turning right just before the masts, we started our descent and enjoyed another extended lunch back on the South Downs Way with views towards the (nearest) coast at Littlehampton - sadly no ice-creams at this point. After lunch, we followed signs to Gumber Bothy and then turned west, and finally south, to eventually reach Stane Street, the roman road. From here, a gentle undulating stroll in a north-easterly direction brought us back to our cars - in time to drive back to the Villa for a well-deserved tea and cakes experience. Starting from the Barbury Castle Country Park car park, we headed in an easterly direction over Smeathe's Ridge towards Ogbourne St George (staying ahead of the Macmillan Cancer charity bicycle-ride riders), with extensive views over the surrounding countryside. We detoured slightly from the route and paused for an extended coffee stop (huddling closely so that we could all benefit from the shade of a rather small tree). After a brief look at the church and a longer look at the selection of thatched buildings, we headed west, uphill and then steeply downhill (south west), to reach the ancient-looking milepost (and the signs warning of road closure in icy weather). We followed the minor road west through Rockley and thence, via Temple Farm to Wick Bottom Barn and then the long climb back up to rejoin the ice-free road just above Hackpen Hill (sadly without sight of the White Horse carved into the hillside there). We continued north to re-join the Ridgeway - which brought us back to Barbury Castle and the associated Country Park car park. Starting from Llanfoist we walked the disused railway line to Govilon then walked up a steep lane to reach the Abergavenny to Blaenavon Road. Crossing the road we had a difficult walk through (felled) woodland before reaching the hillside of the Blorenge. The gradient eased as we walked towards Keepers Pond. A short walk brought us to Foxhunter’s Grave. Foxhunter was a champion show-jumper winning many competitions some 60 years ago. From the memorial it is a short walk to the summit of the Blorenge and from there to the precipitous edge overlooking Abergavenny. After a downhill stretch we reach The Devil’s Punchbowl, a picturesque lake enclosed in a cwm below the summit. Descending over fields to the road we reached the canal before coming down to the village of Llanfoist once more. Staying in Edale Activity Centre (Youth Hostel) after a last-minute switch from Hartington Hall (caused by a complete lack of water at Hartington Hall), the small group enjoyed some hastily planned walks in the Dark Peak area, and one walk retained from the original White Peak programme. Walking from the Activity Centre (a late start to benefit from a shorter walk and the improving weather forecast), we headed west into the Vale of Edale before turning north on a concession path parallel to Oller Brook. This then turned west to reach The Nab - an excellent spot for a coffee-break. Continuing north we reached the plateau of Kinder Scout at the top of Golden Clough, where we turned right to follow the clear path before turning left to take a bearing north to reach the summit trig (not the highest point of the plateau and actually 40m lower than the trig at Kinder Low). Another bearing led us to Madwoman's Stones and thence a faint path to (one of) the paths that follow the plateau edge. This brought us to Crookstone, where we descended to return to the Youth Hostel via the bridleway which roughly follows the Open Access Land boundary. 12km, 500m ascent: some pathless sections over rough peat. A short drive took us to the Fairholmes car park just below the Derwent Dam (where the 617 "Dambusters" squadron memorial is located). Walking north from the dam, we followed the eastern side of the reservoir to Abbey Tip Plantation, where we turned east to climb parallel to Abbey Brook. We followed the clear path all the way to the Cartledge Stones Ridge where the limestone slabs then guided us to the trig point (and saved us from fighting our way across the soggy peat). After lunch at the trig, we detoured to the Lost Lad topograph/viewpoint, before returning to descend in a southerly direction past Cakes of Bread, Dovestone Tor and the Salt Cellar to follow the road back along the north-eastern edge of Ladybower reservoir to reach the car park. 19km, 600m ascent: mostly clear paths, some peaty/boggy sections. Another walk starting from the Youth Hostel, again heading west to Ollerbrook, but then heading through Edale village and on to Barber Booth before joining the Pennine Way at Upper Booth. Continuing in a north-west direction, we climbed Jacob's Ladder before turning left to follow the new(ish) limestone slab path which lead to the trig on Brown Knoll and then on to meet the Chapel Gate track (with no real alternative but to follow it the entire way). We followed the byway south (right), to reach the bridleway across Rushup Edge via Lords Seat and on to Mam Tor, Hollins Cross, over Barker Bank, to descend to Backtor Farm and thence, after a short section of road walking, to follow the track back to the Youth Hostel/Activity Centre. 20km, 650m ascent: lots of mud. Starting from the Alsop Station car park (on the Tissington Trail), 20km south of Buxton on the A515, we followed the Tissington Trail south for 500m, before turning east to head across often muddy and soggy fields to reach Parwich - where we enjoyed coffee on the village green. We then followed the Limestone Way south-west, steeply up, down and then up again - to cross the Tissington Trail and then into Tissington village - passing the impressive Tissington Hall. We continued on the Limestone Way, down the Avenue, through Tissington Gates and then across some more soggy fields to reach the open access land just north of Thorpe. Suitably refreshed (from lunch), we descended via Lin Dale into Dovedale by the Stepping Stones (above water-level, but the approach on either side was flooded). We followed the river valley north to reach the bridge at Milldale where we turned right to climb steeply out of the valley. We continued east, with dramatic views down into the valley, before turning slightly south to join Green Lane and finally turning north-east across a final muddy field to return to the car park. Starting from Burrington Ham car park at the top of Burrington Combe we walked south and followed the edge of Black Down before heading to the twin masts of the wireless station above Charterhouse. On the way up we found the remains of snow drifts from last weekend's return of the 'Beast from the East' across the path. We then walked down the lane over more snow to reach Velvet Bottom. Our route then turned west walking through Velvet Bottom and stopping for coffee in some very welcome warm Spring sunshine. After coffee we continued to Black Rock, crossed the road and climbed up the path on the south side of Cheddar Gorge, the way was between dry hedges formed from scrub cleared as part as the habitat management works. Walking along the top of the Gorge with fantastic views over Cheddar Reservoir in yet warmer sunshine we took an early lunch before heading on to the lookout and the top of Jacob's ladder. Having descended the steps and made use of the facilities in the town we walked past the allotments at Hamfield to reach the bottom of the track at Warrens Hill, which took us west of Bats Combe Quarry. Following the track and path which was quite steep in places alongside the quarry fence we reached the race track on Warrens Hill Road where stock car racing was in progress. Following the road to Tynings Farm we then headed up a track that brought us back on to Black Down. 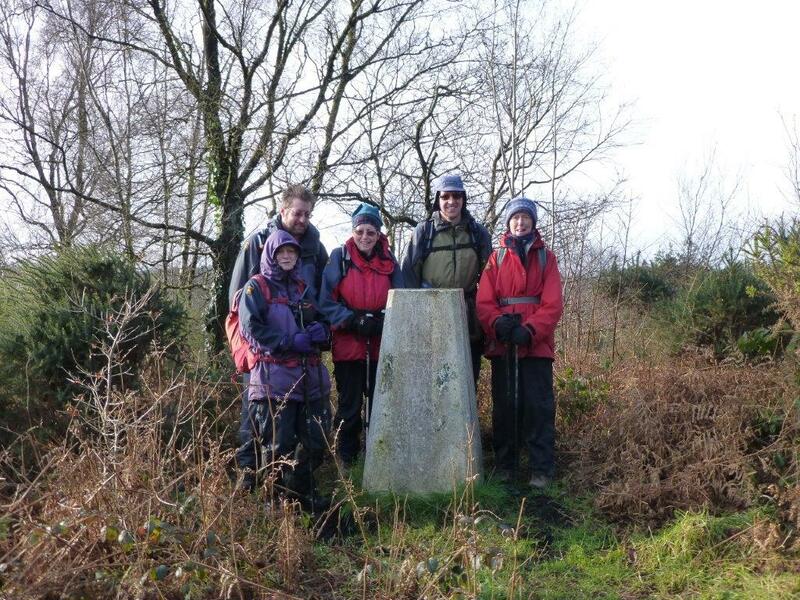 Walking first north and then east we enjoyed an apple break at the trig point - 325m the highest point on the Mendips. It was then an easy walk back down to the car park, where some of us fell to the temptation of the waiting ice cream van. Starting from the car park at Two Bridges (after a delayed start to miss the worst of the rain), we headed north towards Wistman's Wood where we stopped for coffee, sheltered from the wind and rain on the edge of the wooded area. While this interrupted the wind, it had little effect on the water dripping from the trees! We then climbed to Longaford Tor and on to Higher White Tor and Lower White Tor, all shrouded in mist. 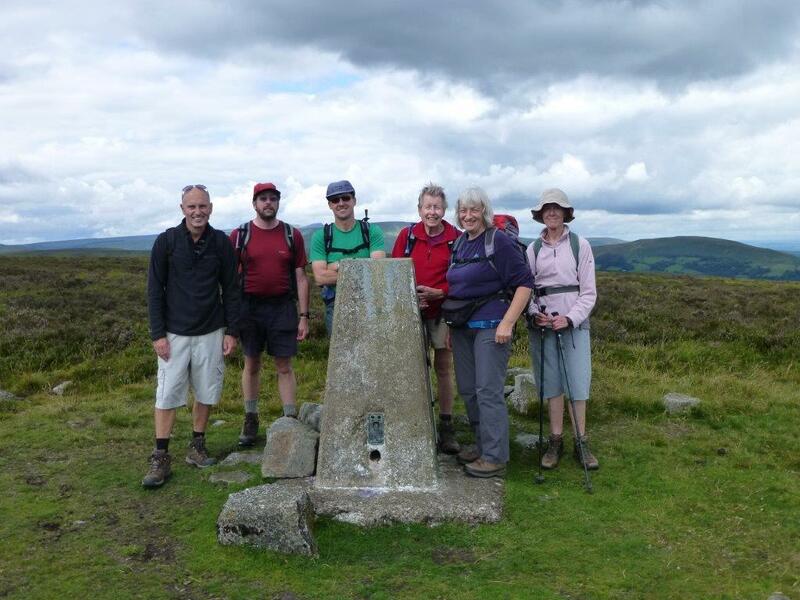 Our plan was to continue across the West Dart to Rough Tor, Devil's Tor and the Beardown Man standing stone, Lydford Tor and Beardown Tors before returning to the cars. Learning from two Ten Tors supervisors that the river was, effectively, un-crossable, we retraced our route to Higher White Tor and then dropped down to the weir for a sheltered lunch stop. The mist finally cleared so after lunch we climbed back up to Longaford Tor and then followed the ridge south, over Littaford Tor to Crockern Tor (site of the Stannary Parliament), before dropping back to rejoin our outward route. Planned route: 13km, 350m ascent, one stream crossing. Starting from the car park at the eastern end of Burrator Reservoir, by Norsworthy Bridge (after an unusual experience of driving down what looked like a small river just after the cross at Cross Gate), we followed the track past the ruins of Middleworth Farm to Deancombe. We scrambled over a small snow patch at the bottom of the track, surprised at its continuing presence after the snows of the previous weekend. Continuing on the same line, beyond the deserted settlement of Deancombe, we discussed the shape of Cuckoo Rock (or was it an imposter? 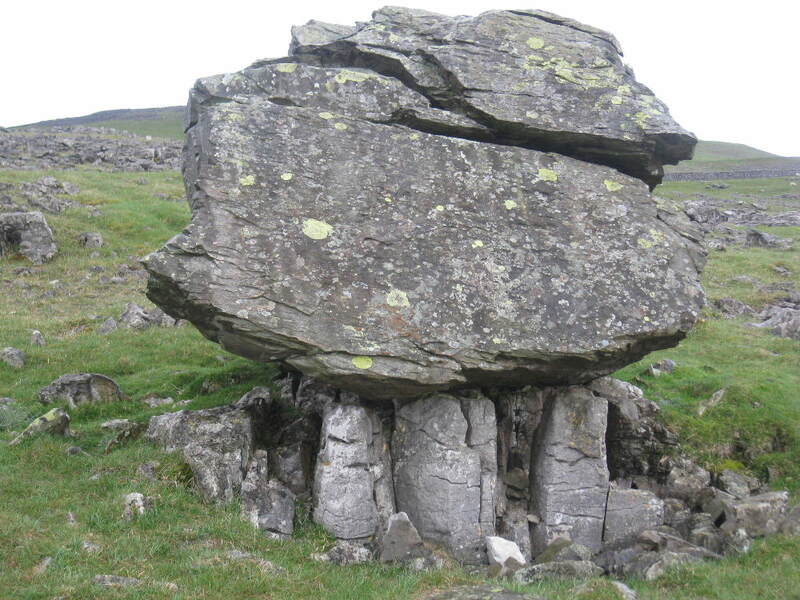 ), before turning left (North) to climb up through the scattered stones and walls. Crossing the final wall, we took a bearing in the mist and headed straight for the Stone Row on Hingston Hill. Wisely deciding against counting the standing stones, we followed the store row in a north-easterly direction and continued first to the enclosure and cairn and then over some rough ground to join the Devonport Leat and follow it to the tunnel. The former tin mine workings gave some shelter for coffee, and suitably refreshed, we crossed the short muddy patch to reach the good path at Nun's Cross (aka Siward's Cross) where we turned left (towards Princetown). We followed the good path for about 1.5 km (miscounting boundary stones), until we reached the corner of the wall where we turned left to head straight towards the trig-point and then continued to Cramber Tor. Now out of the mist, but in the rain, we turned left and headed towards Crazy Well Pool taking advantage of the footbridge over the Devonport leat. With an optional detour to the restored cross, we joined the bridleway which led to the Leather Tor clapper bridge and then back to Norsworthy Bridge and the car park. There was thick frost on the ground and a strong cold wind as we left St. Briavels. After walking through to woods on the level, we went on a downward path to a little uninhabited cottage. Following a path on down to the river we chose a spot in the sun for our coffee break. We walked along the river bank in the sunshine before crossing Brockweir Bridge and climbing up the other side to reach the Wye Valley Walk. Here the cold wind was very noticeable but we came upon a car park with picnic tables in the sun so no-one objected to a slightly early lunch. We then followed the Wye Valley Walk through Botany Bay, Cleddon and Pen y Fan before descending steeply to the valley at Bigsweir Bridge. After a lovely path through the woods we were faced with the steep climb back up to St. Briavels. 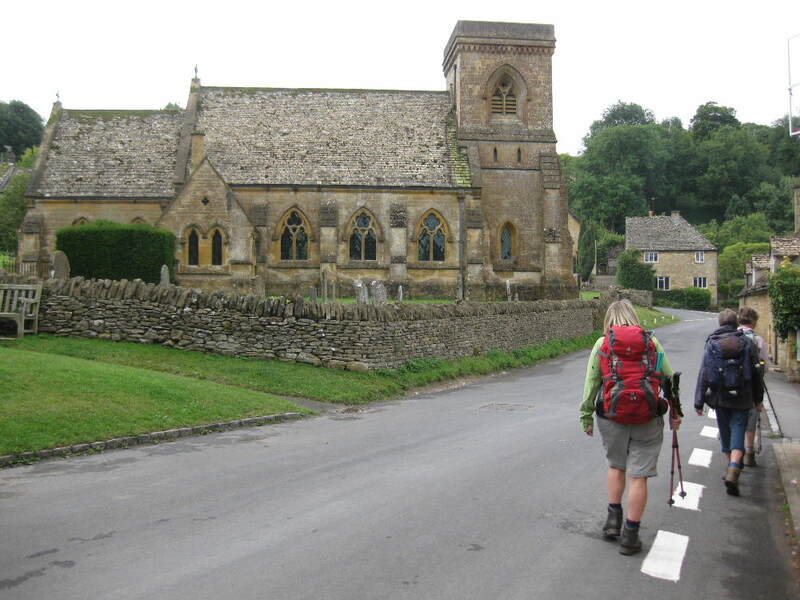 The largest number of walkers for a long time set off from Winchcombe on the Cotswold Way. We had coffee near Hailes Abbey before tackling the long hill up to Buckbury monument. After admiring the newly planted avenue of trees going towards Wood Stanway, we followed Campden Lane to Lynes Barn. The lane then continued on to Deadmanbury Gate, but we stopped part way down the track to admire Farmcote Wood Farm which had been rebuilt in the last few years and is now an '18th century' mansion house with eleven bedrooms! We joined the Wardens Way and the Windrush Way, passing Sudeley Castle, on our way back to Winchcombe. The planned walk in Monmouth was cancelled due to snow. Starting from the Lower Blaen y Glyn Car Park, a group of eight followed the river upstream (on an unmarked path) past the waterfalls. After crossing the fence, we turned right (east) to climb steeply up out of the stream valley. After the Remembrance Exhortation (and a pause for coffee) at 11am, we continued climbing to reach the cairn at the southern point of the escarpment summit. We followed the edge of the escarpment and then another unmarked path to reach a small cairn, by a puddle (clearly marked on the map!). Turning left on a bearing, we followed some faint 'sheep-tracks' to reach the escarpment edge again, immediately above the Canadian Memorial - and the collection of wreckage. 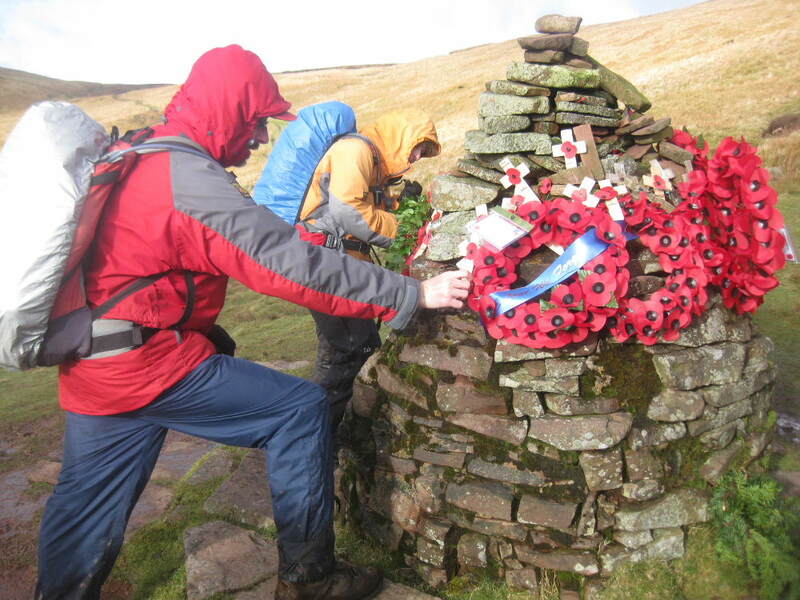 The Memorial cairn was decorated in poppies and memorial crosses - having been host to a group estimated at about 100 for the 11am ceremony. We found a sheltered spot for lunch, out of the bitterly cold wind, while a few other walkers paid their respects at the memorial. We then followed the clear (again unmarked) track north-west to join the clearly visible main path south-west via Craig y Fan Ddu to join the Beacons Way and drop back to the upper car park. After a brief discussion about the justification for a Taxi Point at such a remote car park, and any reason(s) for the abandonment of a single boot and thick sock (now thoroughly soaked by the earlier heavy rain) at the picnic table, we followed the link path back down to the lower car park and our waiting cars. The wind strength increased steadily throughout the night (judging by the noise of the telegraph cables blowing around outside) but, undeterred by the swaying trees and hedgerows, we bravely set out on Saturday to find the sea-shore. Having (briefly) watched the storm clouds drifting, and enjoyed the sunshine and rain (in equal measures) while watching the white horses, we returned to the bunkhouse in time for coffee. Fortunately most of the group had taken precautions in case Brian had an impact on the weekend: extra milk, extra wine, extra snacks/biscuits and some games/puzzles were all in place. The planned planning meeting was brought forward and was quickly concluded allowing more time to concentrate on the wine and puzzles - is there a better way to spend a stormy afternoon ? A small group of nine left the car park below Grwyne Fawr Reservoir and climbed through woods and across the open hillside to reach the ridge near the Blacksmith’s Anvil. We then descended into Capel y finn, stopping for our elevenses beside a gently babbling brook. Just before reaching the village we had to stand to the side of the path while about twenty young people on ponies passed by. We walked a short distance up the road, then up a steep field and on up a gently sloping path stopping for lunch in a sheltered spot out of the wind. Having admired the magnificent views towards Hay we walked on to our descent path beside the reservoir which made for a relaxed end to a remarkably warm October day. 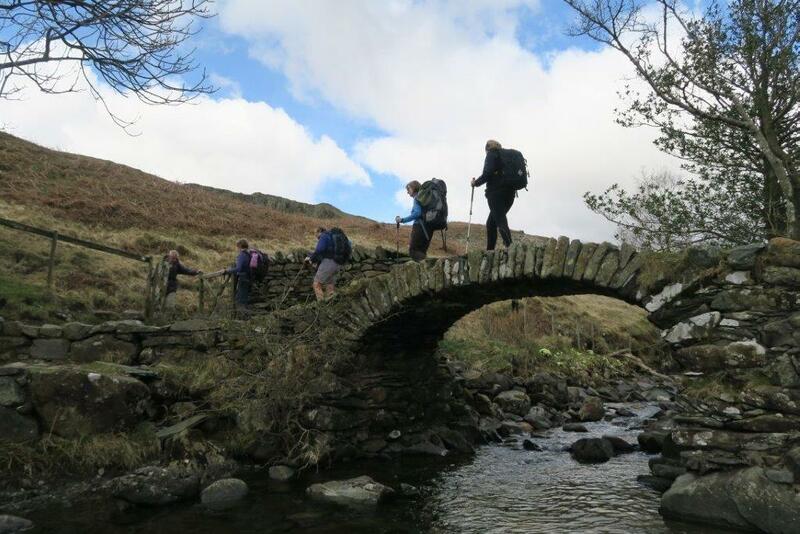 Staying at: Langdale YHA we enjoyed four days walking classic rounds of the Lake District. On day one (Saturday) starting at the Old Dungeon Ghyll Hotel we walked up to Pike O’ Blisco before dropping to Red Tarn and then ascending to the Crinkle Crags. From the end of the ridge we walked down to Three Tarns and then following a tricky descent into Oxendale we walked back to the Hotel. On day two we walked the Coniston Round. 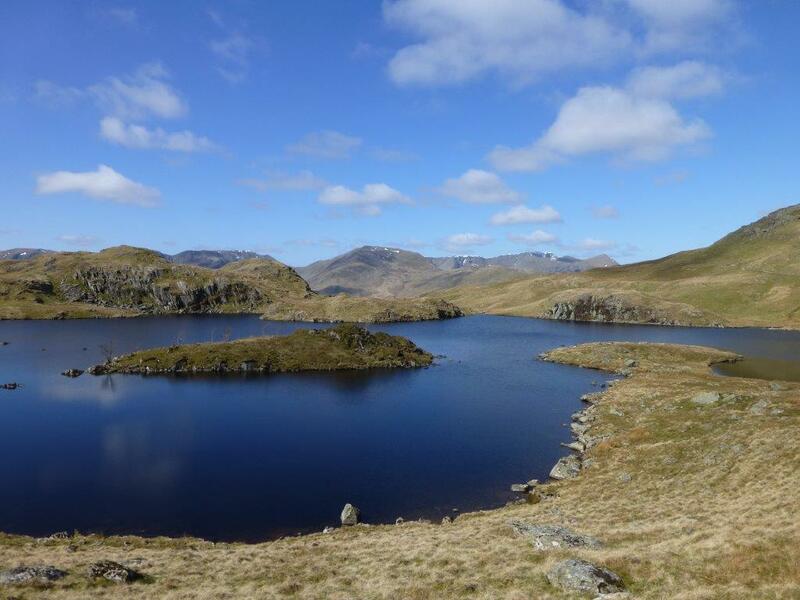 Starting in Coniston village we walked through the Coppermines Valley to reach the summit of Wetherlam then descending to Swirl Hause before a scramble to the top of Swirl How and a lovely airy tramp to the top of Coniston Old Man via Brim Fell. After a long descent through disused quarries we made our way back to Coniston. On day three we walked the Fairfield Round. Starting in Rydal we walked into Ambleside before taking the route to High Sweden Bridge and gaining the ridge above climbing to Low Pike, High Pike, Dove Crag, Hart Crag and finally Fairfield. From Fairfield an undulating descent over Great Rigg, Heron Pike, Lord’s Pike and Nab Scar brought us back to Rydal. 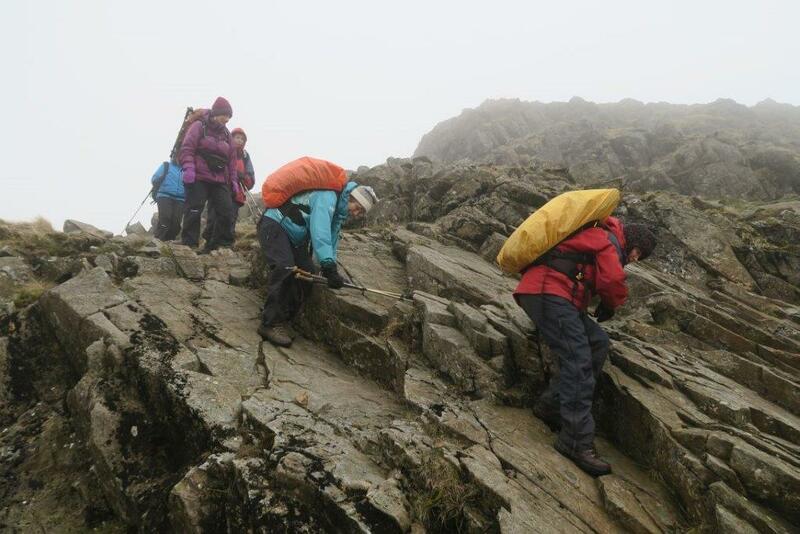 On day four we tackled the Langdale Pikes. Once more starting at the Old Dungeon Ghyll Hotel we walked through the Mickleden Valley before a very steep climb brought us to Martcrag Moor. Walking through very boggy ground we gained the summit of Pike O’ Stickle followed by Harrison Stickle and Pavey Ark. Following a difficult descent through Easy Gulley we came to Stickle Tarn and then walked down to the Hotel once more. 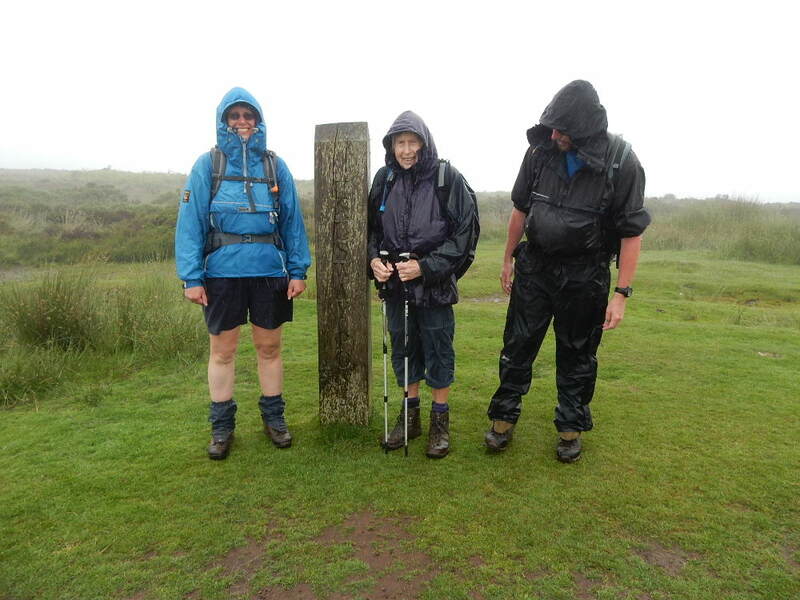 Due to poor weather, the planned walk on the Quantocks will be rearranged for a later date. Starting from the car park on the A419 at Cowcombe Hill east of Stroud we first descended to the Thames & Severn Canal at Chalford. We then followed the canal through this delightful valley until we took a slightly later than nomal coffee stop by the bridge at the edge of Siccaridge Wood. After our break we climbed up through the wood and then on to the Daneway Banks Nature Reserve. Unfortunately it was the wrong time of year to see the Large Blue butterflies, but we did catch sight of an Adonis Blue. We then entered the woods of Cirencester Park, part of the Bathurst Estate. Part way through the woods we turned left and headed up hill again to cross some open fields and reach the high point of the walk at the Gloucestershire Beeches where we had lunch on the edge of the polo field. Having gone back down into the woods the bridleway took us alongside Pinbury Park before we turned towards Sapperton, where we explored the historic church. From the church we followed the footpath down to the portal of the Sapperton canal tunnel before heading back up hill through more woodland with some muddy paths to Frampton Mensell. Here we felt a few drops of rain forecast for late afternoon, but fortunately we were able to get back to the cars before it became heavy enough to require waterproofs. The July walk followed paths between the pretty villages of the northern Cotswolds and through the fields and woods between them. Starting near Snowshill manor we walked north out of the village to join a byway that brought us to the village of Taddington where we enjoyed coffee. We walked south to Cutsdean passing an ancient sheep dip then made our way up hill to reach the road at Stump’s Cross. Joining the Cotswold Way the vast expanse of the Evesham plain was spread out before us and we ate lunch admiring the views below. Next after a steep walk downhill we wandered through the lovely villages of Wood Stanway, Stanway and Stanton before the steep ascent back to the ridge above Snowshill. A weekend to celebrate 40 years of CHWC staying at Prattshayes Bunkroom & Campsite. The weather was kind to us with lots of blue skies. Those arriving early on the Friday went for a short walk from Prattshayes to see the Exmouth Geoneedle before descended to the beach. We had welcome ice cream (not the only one this weekend!) from the caravan park bar before walking back in time to drive to the Grove pub for an evening meal. On Saturday we drove to Otterton and followed the river Otter a short way inland, looking at a tree that had been felled by beavers. We then looped round to the coast for a coffee break overlooking the stacks at Ladram Bay. From here we followed the coast back towards Prattshayes with lunch near the bridge over the Otter. There was a detour for more ice cream at Budleigh Salterton before we completed the last section of the walk to join our route from the previous evening. After fetching cars and showers we had a celebratory barbecue at the campsite. On the Sunday we drove east, parking the cars at Weston Mouth having briefly been stuck in the queues for the car show at the Donkey Sanctuary. The walk took us to Branscombe along the beach having descended the steep path through the Shoots with huts clinging to the hillside. 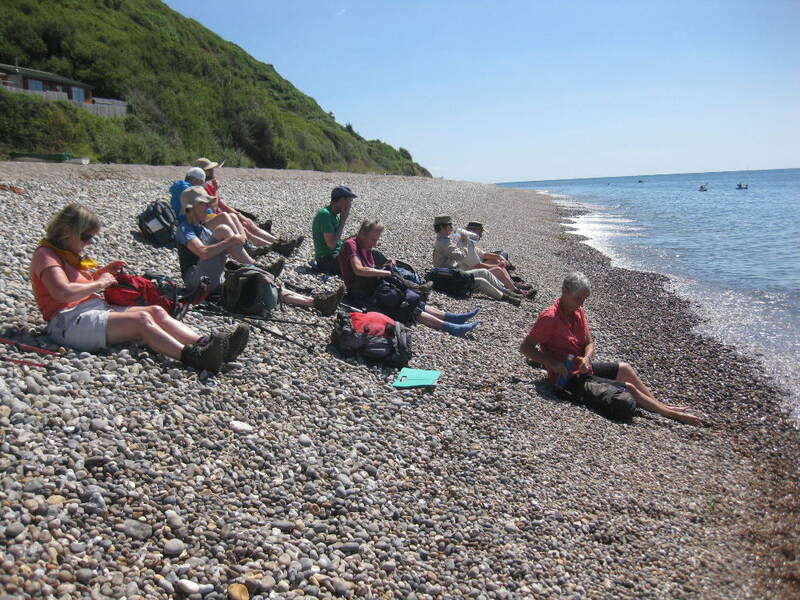 At Branscombe we did a loop through the 'Undercliff' to Hooken Cliffs. Another ice cream before climbing through the village and past St Winifred's church to rejoin the coast path and return to the cars. 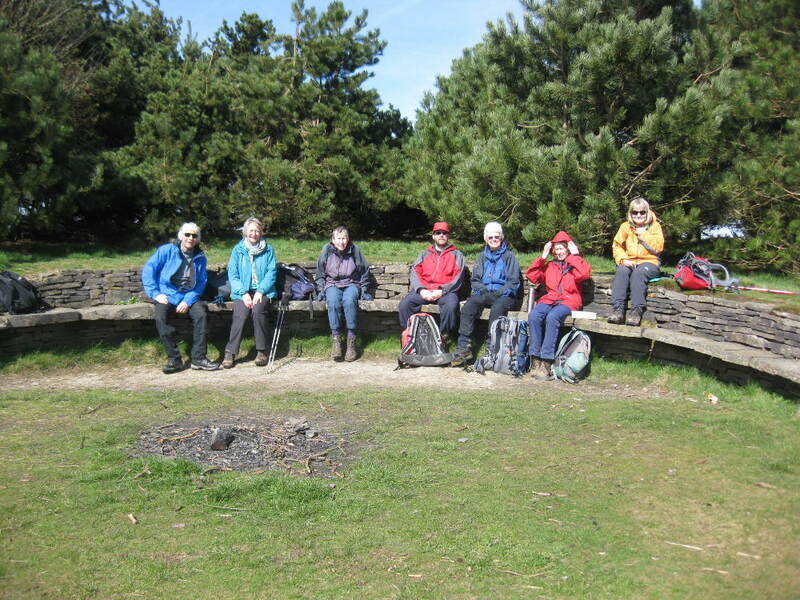 Six walkers met at Coley Peak near Stroud to enjoy a walk in the Cotswolds. From the car park there lovely views looking north over the Severn Vale and the Forest of Dean. The grassy areas are covered in wild flowers including Sainfoin and ox-eye daisies. Leaving the car park past the long barrow we walked on the Cotswold Way through woodland to reach Pen Hill where we enjoyed a coffee break before descending to the Stroud Water Canal via King’s Stanley. This part of the canal has been restored and is lined with some lovely houses and gardens. From the canal we climbed steadily uphill to Selsey Common. The Common has carpets of wild flowers on its flanks including hundreds of purple orchids, rock rose, milk wort and many others. We lunched on top of Common which has extensive views over the lovely Cotswold countryside and its many villages. Further afield we could see the Severn, May Hill and the Malvern Hills. From the Common we walked south steeply downhill through grassland where there were a number of a very unusual parasitic plant called Purple Broomrape. Continuing down through a large vineyard we arrived at Woodchester Park. The path climbs steadily through woodland to Woodchester Mansion where we enjoyed ice creams before climbing once more to Coaley Peak. 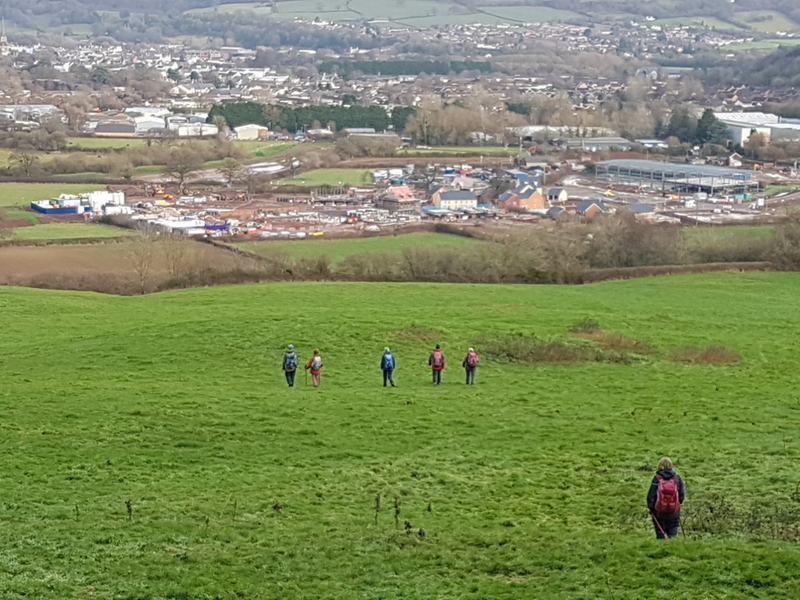 Starting from the Cadbury Castle car park (ST 631253) - approx 3km south-east of Sparkford, the group walked north into South Cadbury, before turning west down Folly Lane to complete a half-circuit of the ancient hill fort. On reaching Sutton Montis, we headed south to climb the lower ramparts of Parrock Hill which provided a sheltered spot for coffee. Suitably refreshed, we continued south along Corton Ridge (bypassing Corton Denham) to descend into Stafford Green. A short stretch of uphill road walking took us to Wheatsheaf Farm, where we turned north, and then north west to reach the summit trig on The Beacon - which provided another sheltered spot, this time for lunch. After lunch, we descened the northern 'nose' of The Beacon, to reach the minor road where we turned east and then north before taking a footpath heading north east. Circumnavigating a field of rapeseed (which hid all signs of the Medieval Village Of Whitcombe), we turned south east to gradually climb up to Slait Farm, where we turned north to cross a number of increasingly challenging stiles before following a track past Compton Castle into the village of Compton Pauncefoot. Another short section of (flat) road walking led back to South Cadbury, and thence to the summit of the fort. An extended 'apple-stop' at the topograph was eventually brought to an end by the increasingly currious, and decidedly slobbery attention of a herd of young cows. Staying at Ingleton Hostel The spring break of 2017 was based in the former YHA but now independent hostel in Ingleborough. Four walks on four days with fine dry, sunny weather but an ever-present north wind making it felt cool. On day one we drove to Horton-in-Ribblesdale. From the edge of the village we walked south on the bank of the Ribble to Helwith bridge before crossing the A65 to ascend Long Lane, a track that brought us to the lower slopes of Pen-y-Ghent which then joined the Penine Way to the summit trig point. A long airy tramp brought us to Plover Hill. We then descended to a bridal way on the side of the valley which brought us to Hull Pot lower down. Hull Pot is a huge hole left when the roof of a cave system below collapsed. Re-joining the Penine Way we descended to Horton. 19.2 km with 612 metres of ascent. Day two we drove to Clapham to make the ascent of Ingleborough. Walking north from the village the track passes Ingleborough Cave climbing up the narrowing valley to Trow Gill where a short climb on loose rock brought us on to the moorland and to Gaping Gill. Gaping Gill is a large pot hole that drops vertically for some 190 feet into a huge cavern that is said to be big enough to house York Minster. The cave system with its many tunnels is the largest in England and connects with Ingleborough cave. A good made-up path then brought us to the summit trig. From the summit the path brought us to Sulber Gate where we turned south to walk back to Clapham. 16.8 km with 683 metres of ascent. Day three we drove to the iconic Ribblehead Viaduct. 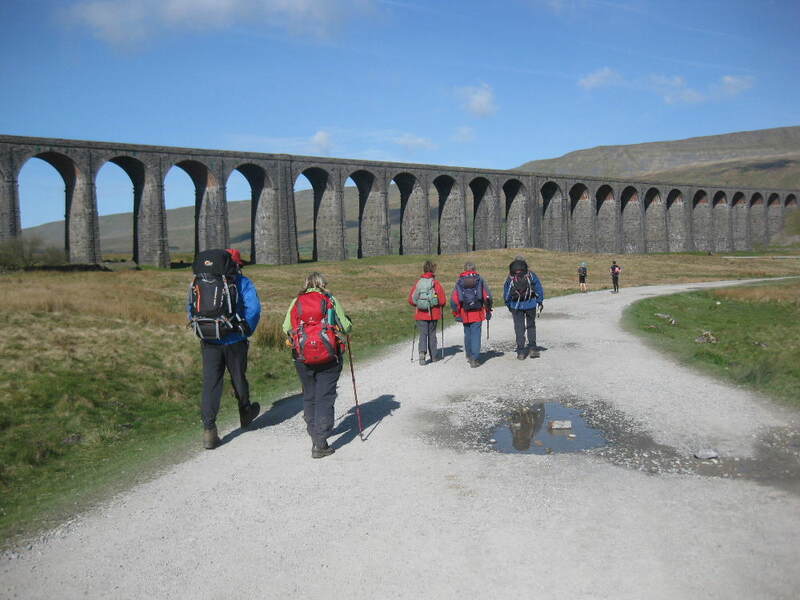 Walking under the impressive structure we reached farmland which brought us to a track which climbed at a gentle gradient to the southern end of the ridge of Whernside. On the last day we drove to Austwick. Walking north out of the village we climbed steeply to Norber where there are many large boulders of dark Silurian rock which had been carried from afar by glaciers. When the glaciers retreated, the boulders were left on the limestone pavement. They are balanced precariously on plinths of the now eroded limestone. From Norber we walked round the head of the of Crummock Dale on more limestone pavement before climbing up to the trig point above Moughton Scars. A steep descent brought us to a walled lane before walking over fields back to Austwick. 13.2 km with 473 metres of ascent. 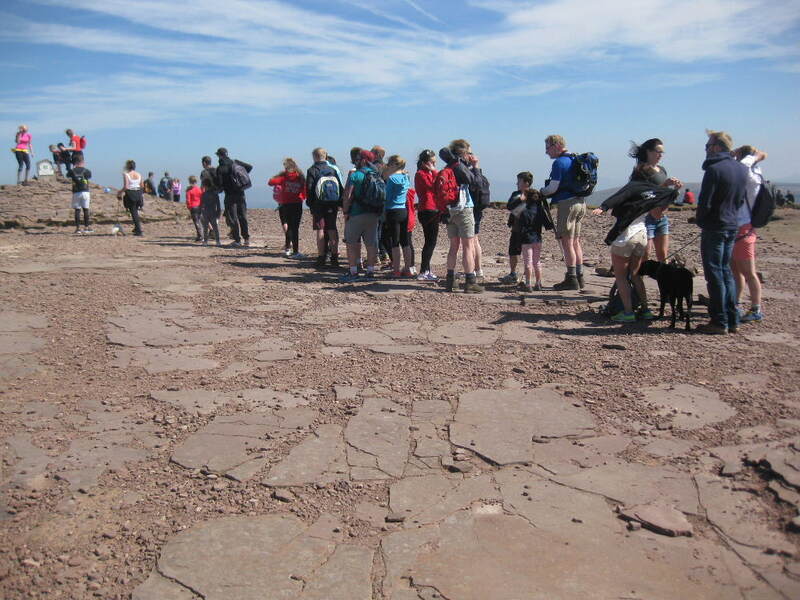 On a sunny Sunday morning, six walkers set out to enjoy the fairly challenging round of the Brecon Beacons. Starting at the car park south of the Neuadd Reservoirs there were stunning views of the peaks ahead. A new path has been engineered from the reservoir dam up to the ridge on the western side of the valley. This path has made what used to be a muddy, stony and boggy slog into a delightfully easy ascent of this steep slope. From the trig point on the ridge we walked north to the first summit of Corn Du where we caught sight of the hundreds of walkers making the climb from the Storey Arms car park. From Corn Du we walked on to the summit of Pen y Fan hoping to find a lunch spot out of the keen wind. On the summit an orderly queue of walkers waited patiently for their turn to take pictures from the summit cairn, a sight which we all found rather amusing. The next summit of Cribyn follows a steep climb from the bwlch followed by a nice ridge walk before the descent to the Roman Road. A long and easy descent brought us back to the cars at the end of a lovey day. 15.1 km long and accumulated ascent of 764 metres. Woodlands Bunkhouse near Glasbury a village just west of Hay-on-Wye was the venue for the spring weekend away for the Hillwalkers. Saturday dawned cold and bright and we were eager to get on the hills as the weather was to be set fair for the whole day. Leaving a car at Painscastle we drove to Erwood craft and tea shop based in the old railway station. The start of the walk was on a pleasant path beside the river Wye before we ascended steeply up to the moorland of Llandeilo Hill. We were walking north east into a stiff breeze but the miles of high level ridge beckoned towards Rhulen hill. With good views in all directions we were walking an old boundary marked with stones one of which was next to the local landmark of Twm Tobacco’s Grave. From Rhulen hill we descended to a minor road before an easy ascent to Red Hill, our final peak of the day. From Red Hill it was an easy walk into Painscastle where we finished the walk. Sunday also turned out to be a lovely sunny day when we explored the Begwns, a compact area of high ground to the south of Painscastle. Starting at the eastern end of the hills we walked below the high ground making our way through farmland where the lack of way markers caused some head scratching for a while. Soon we were on the hills and enjoying the views of the Black Mountains, Brecon Beacons and Black Mountain spread out before us. We lunched on top of the highest point of the Begwns where a group of trees planted to mark Queen Victoria’s diamond jubilee were enclosed in a dry-stone wall known as The Roundabout. After lunch we walked east to another peak before descending to reach the parked cars. On a grey but dry morning we met in the Somerset Coal Canal visitor centre car park to combine the 6 mile Bath Skyline walk with a visit to Dundas Aqueduct and a walk back via Monkton Combe with a chance to see an elephant and a giraffe. By chance it was also the day of the Bath half marathon so all the group were warned in advance to come to the start via the A46 then A36. From the car park we walk to Dundas Aqueduct and then took a steep climb to join the Bath Skyline walk at point 4. 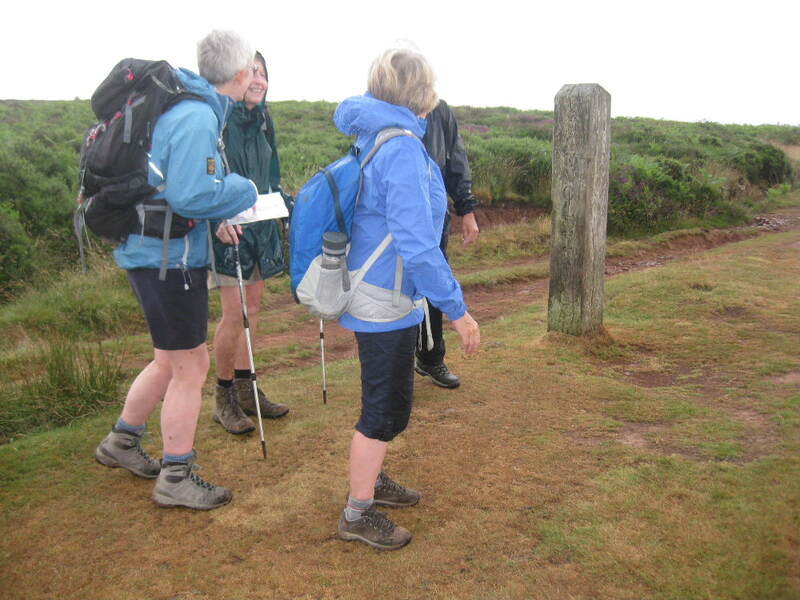 Everyone agreed with leader Susan that the waymarking for the Bath Skyline route was excellent. We would still recommend that anyone following it takes their Ordnance Survey map and the detailed instructions provided by the National Trust but those without a map only found one waymark not totally clear as to where you should be going, and the written instructions clarified matters very well. The walk was muddy through woodland and in a few other places but we were particular impressed with the views from point 1 onwards. While eating lunch we could see the runners in the distance and hear the commentary. Sham Castle was new to some of our walkers. Walking through Monkton Combe we not only spotted sculptures of an elephant and giraffe (their owner said they were brought back from Kenya) but we also saw a privet topiary elephant. A thatched cricket pavilion was remarked on as we neared the end of our walk. Muddy boots were left in our cars while we enjoyed cake and hot drinks at the visitor centre cafe before saying our goodbyes. Seven members of the group set out from Peterchurch, Herefordshire for a circular walk around the Golden Valley. Heading uphill we passed through Upper Mowbage then reaching more level ground we had views of the Black Mountains and Hay Bluff all dusted with snow on the easterly side. Continuing along we reached Rough Leath Wood and began descending back down through the woodland to open meadowland and on to Birchy Wood. Before descending further and losing the views, we stopped for coffee in a field at the edge of the forestry where the Gorse was starting to flower. We continued the path downwards and eventually reached the road taking us on to Wellbrook Manor (Grade 1 Listed 14C). Here we left the road and again proceded uphill across a field to a sunken lane. Just beyond this we took a short, sharp uphill route which provided open views across Peterchurch village, the church of St Peter with its fibreglass spire and beyond once again to the Black Mountains and Hay Bluff . Continuing along through fields and woodlands and climbing over several ancient stone stiles, we arrived at an open farm track this time with views of the Malverns and shortly afterwards, Hereford. 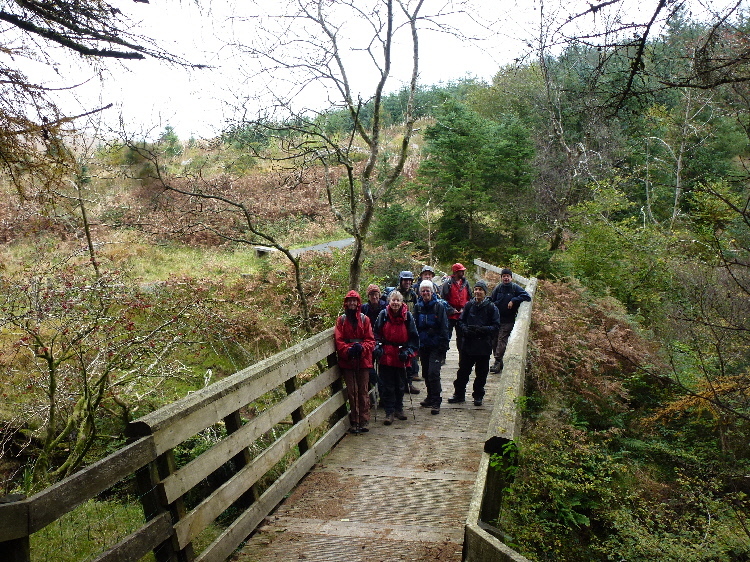 Leaving the open views we entered Rushen Wood and emerged to the sight of a surprisingly steep valley. This climbed, we treated ourselves to lunch which was enhanced by sunshine and southerly views down the Golden Valley and, what we considered after much debate, was possibly the Skirrid and Sugar Loaf mountains. After continuing along through similar countryside we made our way downhill to the B4348 and crossed over into Vowchurch. Here we entered the church to view a small exhibition of letters written by Lewis Caroll to his younger brother, the Reverend Skeffington Hume Dodgson, who was the vicar there between 1895 and1910. Also of interest were the pots of jam and pickles left on sale in the porchway of the church by members of the community. Leaving the church, we crossed the bridge over the River Dore and on into Turnerstone. Here we viewed a house with old petrol pumps and interesting old motoring signs. Retracing our steps slightly past Turnerstone Church, we continued along the banks of the river until we reached access to the pretty camp site where the path was diverted onto the Herefordshire Way which we followed back into Peterchurch. The group spent a short time looking around St Peter's church and its graveyard, where a recipient of the VC is buried, before departing for home. NB: Private Robert Jones born Penrose, Raglan, won the VC on 22/23 January 1879 aged 21 at Rorke's Drift, Utrecht, Kwazulu-Natal, South Africa, during the Boer War. Died Peterchurch on 6 September 1898 aged 41. 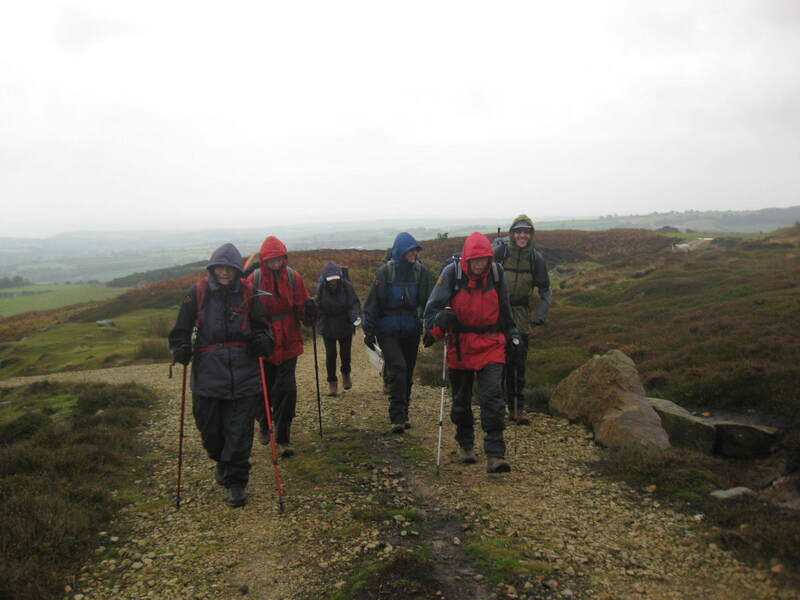 A group of eight walkers set off from Barrow Wake viewpoint in drizzly rain. We followed tracks and footpaths to the village of Coberley. A coffee break was taken in a field outside the village, then we crossed the A435 road into a muddy field. Having crossed the field and through a wood we came to a farmhouse with a long low building with nine sets of double garage doors. Did the owner possess nine cars? After another mile of walking we reached Cockleford Farm and onwards to Elkstone. A pretty village with a church, and in the graveyard we were surprised to see three very fine bug houses. Was it a competition? Who knows! We continued on a track passing under the A417 and over three fields before we stopped for lunch. The weather forecast had been for steady rain all day, but luckily our refreshment breaks had been dry although the rain came on heavier in the afternoon. We continued on through the village of Brimpsfield, then across the fields to Birdlip and on to our waiting cars. The walk started in Monmouth following the Offa's Dyke Path, first through fields and then woods, slowly climbing. Emerging back into fields we left the Offa's Dyke Path, a local boarder collie making sure we were on the right path, before stopping for coffee with a wonderful view of rolling country side. We then descended into Dingestow. Climbing up from here we passed Treowen, an unusual three storey, grade one listed, 17th century farm house. Lots more up and down through fields and more woods with some pretty awesome views of the mountains further into Wales. Back to reality, as we passed the new estate being built as we returned to Monmouth. Starting from Coombe Dingle carpark on the Blaise Castle estate we set off following the River Trym to where it feeds into the River Avon at Sea Mills railway station. Crossing the Portway we paid a visit to the wicker whale(s) in Bennett's Patch and White's Paddock. The Severn Way took us along the side of the River Avon, up to the view point over Horseshoe Bend and down to Local Nature Reserve Lamplighters Marsh where we followed the "yellow brick road". Crossing the Portway we made our way up to our only trig point of the walk at Penpole Point on the Kings Weston estate, where we paused for lunch. We continued to walk past the remains of Penpole Lodge to look at Kings Weston House and then puzzle of how the "Echo" might have looked in its heyday. The footbridge to the Blaise estate was closed thanks to damage caused by a lorry so we made our last road crossing to Blaise Castle to enjoy the views before descending to follow the river Trym down to Coombe Dingle car park. The November 2016 weekend was based at the excellent independent The Old School Hostel in Trefin, Pembrokeshire - last visited in June 2012. We took advantage of the facilities offered by the Ship Inn, a short distance away, on the Friday evening - but self-catered in the hostel on the Saturday night. Saturday's walk was a repeat of the circular walk from Newport, last walked in October 2007. Parking at the free car park by the estuary mouth, we walked through Newport and climbed steadily on to the Carn Ingli ridge (stopping for a sheltered coffee-break just before the summit). After coffee, we briefly inspected the remains of the ancient hill fort before following the ridge in a westerly direction to Carn Enoch where we found a sunny, sheltered spot for lunch. Sadly, due to the shorter day, we had to miss-out on the solitary trig point (visited in 2007) - but we did have lovely views out towards Foel Eryr. After lunch, we descended in a northerly direction to join the coastal path which we followed back to the car park. 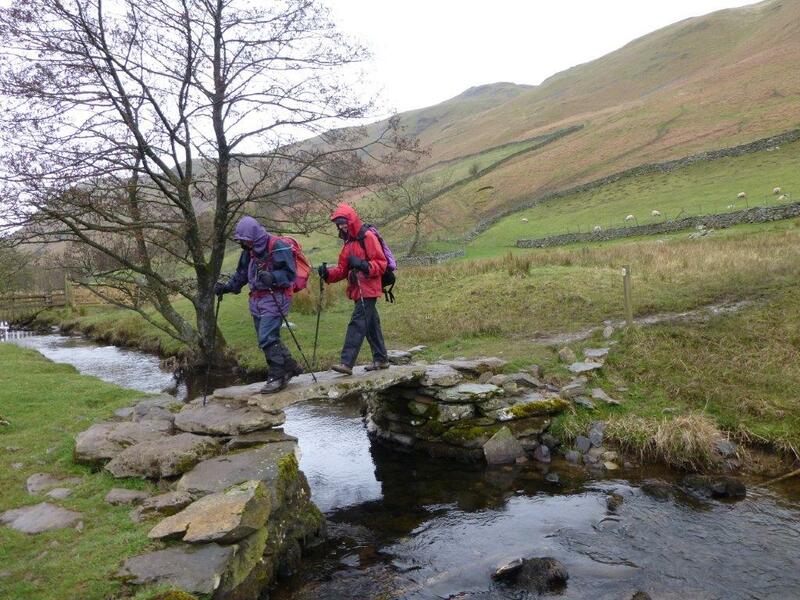 For two of our walkers this walk completed their DofE Diamond Challenge to walk for at least 4 hours in each the 15 UK National Parks during 2016 to help raise awareness of both The DofE and the National Parks. You can help them raise as much as possible to help transform the lives of young people in the UK by visiting their Just Giving Page. On Sunday, we revisited the Golden Road route right across the Preseli Hills (last walked, albeit in the opposite direction, in June 2012). Parking at the Bwlch-y-gwynt car park, we first headed west to the cairn and topograph on the summit of Foel Eryr, before retracing our steps and then continuing east towards the trig point on Foel Cwmcerwyn where, after a 2 minute Remembrance commemoration, we enjoyed coffee at the highest point in Pembrokeshire - with views in all directions. After coffee, we returned to the main track across the hills, and continued east towards Carn Bica, where we headed south over Carn Sian (which provided another sheltered spot, for lunch) before dropping off the side of the hill to the isolated crash site of Liberator EV881 - and its poignant memorial - where we left our remembrance cross and poppies. We then retraced our steps to Carn Bica before starting the descent towards the car park, naturally detouring via Foeldrygarn for the day's second trig. After a quick car-shuffle greatly helped by the non-walkers who had driven between the two carparks, we all headed home. 16km(linear), 400m ascent, 600m descent. Arriving at the start of the walk, we were grateful to find a somewhat cloudy day having left the fairly severe fog behind us on the Heads of the Valleys road. Departing from the northern end of Pontsticill Reservoir, the group of 10 joined up with the Taff Trail travelling in a southerly, but uphill, direction. At the top of the incline, we were afforded views across the reservoir to the boat house. Shortly afterwards, we crossed a footbridge over a surprisingly deep ravine with waterfalls. Continuing along the Taff Trail through mostly forestry, we dropped back down into the valley and took a coffee break in a convenient clearing before reaching the village of Pontsticill. Here we crossed the road bridge over the reservoir and were lucky enough to spot the Brecon Beacons Mountain train in the distance puffing its way along the reservoir. We then made our way up onto Merthyr Common with views of the reservoir from the opposite direction. Following a slightly uphill path, we continued along Cefn yr Ystrad until taking a short uphill path crossing the open moorland in search of the trig point at Sarn Felen. Whilst crossing here the wind increased and we found a hollow in which to have a short lunch break. During this time, the weather had cleared and 360 degree views were then visable which included the Brecon Beacons. The walk continued around the disused quarries and we eventually picked up a path which led us to the top of the magnificent Dyffryn Crawnon valley. Continuing down the stony footpath across moorland, we eventually entered the woodland of Cwm Callan which provided us with some early autumn colours which were enhanced by the lovely sunshine. This path took us onto the road passing by Oakwood/Dolygaer Outdoor Centres. Continuing to descend, we arrived back at the reservoir in lovely sunshine with beautiful views to the north and south and our awaiting cars. 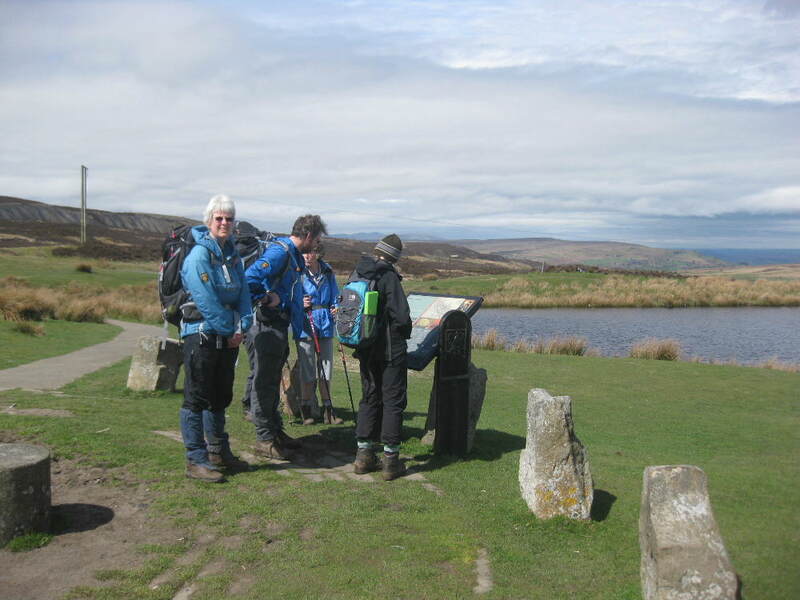 For the autumn break we explored the North York Moors being based at Whitby Youth Hostel. 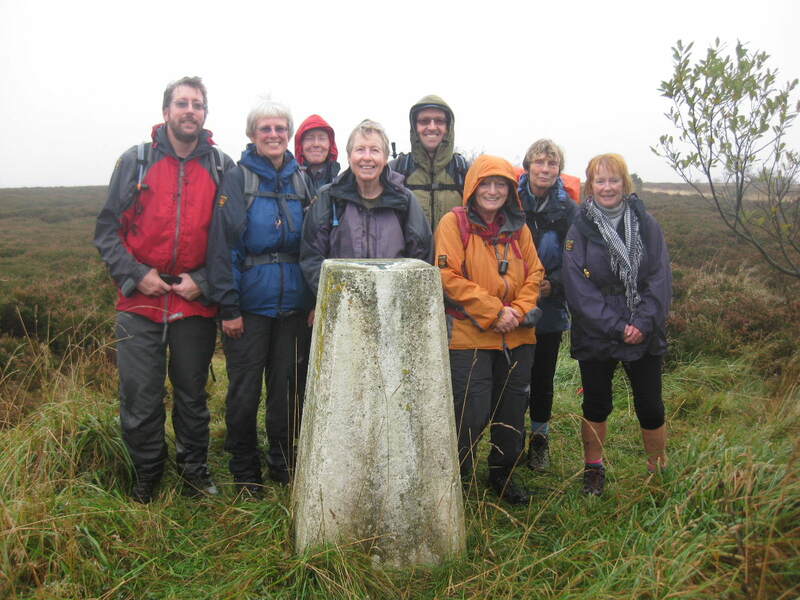 On Friday we started out in light rain from the viewpoint car park at Blue Bank on Sleights Moor. With good views down in the Esk Valley we reached Greenlands Farm and then struck out for the main road across pathless heather and bog. With improving weather we crossed the road and walked eastward to reach Leas Head Farm. From there we walked downhill into Great Wood to view the spectacular waterfall Falling Foss. Walking high above Little Beck we reached The Hermitage a man made shelter. From there it was up hill back over the moor to the cars. On Saturday we drove to Stony Marl Moor to complete a linear walk back to Whitby on the coast path. We walked over the Moor to reach the coast at Ravenscar. From there we walked northwards past Boggle Hole’s youth hostel and the picturesque village of Robin Hood’s Bay. The weather improved and from the cliff tops there were good views of the very large crashing waves. Nearing Whitby the ruined Abbey could be seen high on the cliff a stark silhouette against the blue sky. On Sunday we parked on the coast at Cowbar just outside Staithes. We walked inland in the wooded valley known as The Dales emerging from the trees to walk over fields to Newton Mulgrave and Ellerby. 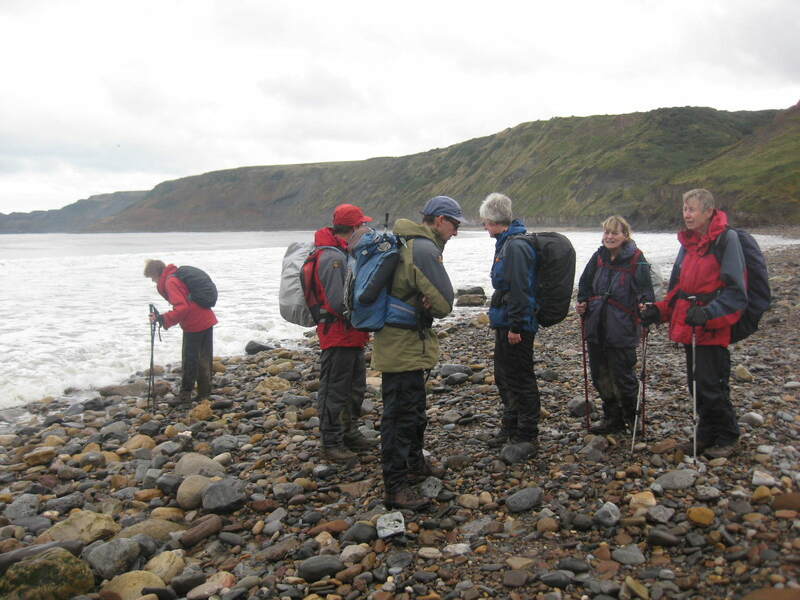 We then headed for the coast at Runswick Bay. Runswick in a lovely village where the houses are stacked in a jumble of little pathways and series of steps on the side of a steep cliff. From Runswick we walked on the Cleveland Way to Staithes another village where the houses are ranged on both sides of steep cliffs above the harbour. 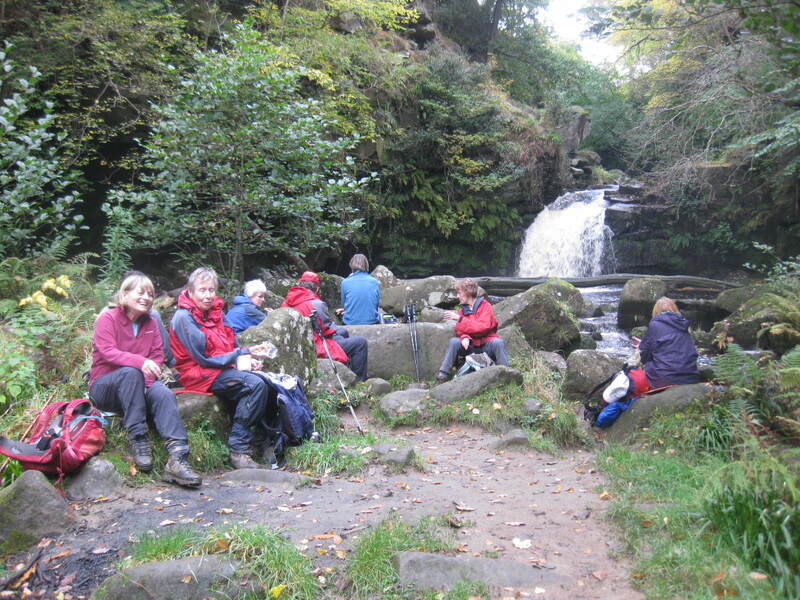 On Monday we drove to Goathland to complete a walk taking in waterfalls on two becks and the high moorland between. Crossing the tracks of the steam railway we climbed up hill out of the valley onto moorland where the autumn colours were much in evidence. Walking north we reached Beck Hole and whilst crossing the bridge over the railway we were treated to the sight of the steam engine powering up the slope from Grosmont and enveloping us in smoke on its way to Goathland. We walked to Thomason Falls on Eller Back where we had coffee and then walked back to Beck Hole. The route went steeply up over the valley side and down again into the second river valley containing West Beck. We walked to Mallyan Spout, a thin curtain falls then on to the moors once more where some of the group visited Nelly Ayr Foss. From there we followed a good path over the moorland to reach Goathland where we enjoyed tea and cake before the journey home. We drove into low cloud as we approached Talybont. Leaving the cars to walk across the dam a chilly wind was blowing but after a short climb to a track under Tor-y-foel we left the cloud behind and walked the level track in the sun above the cloud inversion. Gaining the ridge on the Taff Trail after a very stony lane, we walked towards Tor-y-foel and climbed up the steep slope to the summit. 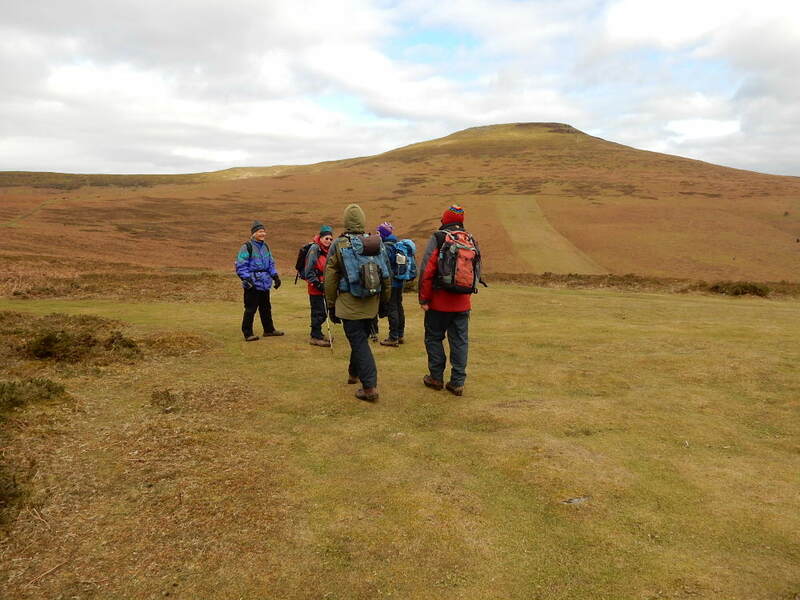 Walking down towards the Brecon Canal we were rewarded with views of the Sugar Loaf and the Black Mountains. Reaching the canal we walked past several locks before gradually climbing up hill to gain the ridge that brought us back to the Talybont Reservoir. 14.3km, 605m ascent. 8.87 miles, 1984ft. ascent. On a bright and blustery day we set off from the view point and car park on the side of Cleeve Hill near Cheltenham. Walking at first downhill and then up over steep fields to Nottingham Hill great views opened up of The Malverns, May Hill, Sugar Loaf and the Black Mountains beyond the flat plain below. Returning to cross the main road we climbed up to the trig point on Cleeve Hill and followed the Cotswold Way across the vast area of the Common with views of Cheltenham and the racecourse way below. Passing through a nature reserve with many wild flowers we reached the end of Cleeve Hill before returning across a different part of the hill to a second trig and three great masts. With a visit to a lone blasted beech tree with a memorial wall high on the plateau we then walked back to the view point. 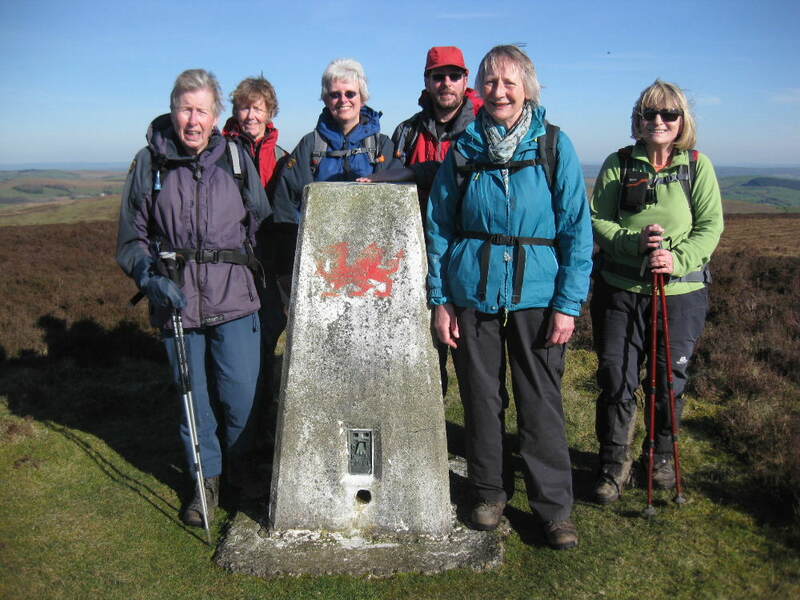 A small party of seven set off from Llangynidr car park in bright sunshine. We climbed up through numerous fields and over many rickety stiles to reach the hairpin bend on the B4560 road. We walked up the road to the Blaen-Onneu quarry where we found grassy areas to sit on for coffee. After walking through the now disused quarry we made our way to the trig point, which is an essential marker in order to find Chartist Cave our main objective for the day. From the trig point there is a good path which leads to the Cave. For once we did not need to seek the shelter of the cave for our lunch stop and were able to sit on the rocks outside in the occasional bursts of sunshine. From the cave we passed many sink holes and followed numerous sheep paths to reach Carn Caws where we stood for a while identifying the route we had taken in the morning. We then continued over the moorland, down past beautifully made stone walls to a large stone monument with the initials WOL engraved on it. From previous research WOL means Walls of Llangynidr and we had a short break to admire the walls and also all the Black Mountains laid out before us. From here we continued through fields and lanes back to the car park in the village. A walk down and then up through the woods on the side of the Wye Valley followed by a very enjoyable evening chatting around the BBQ. 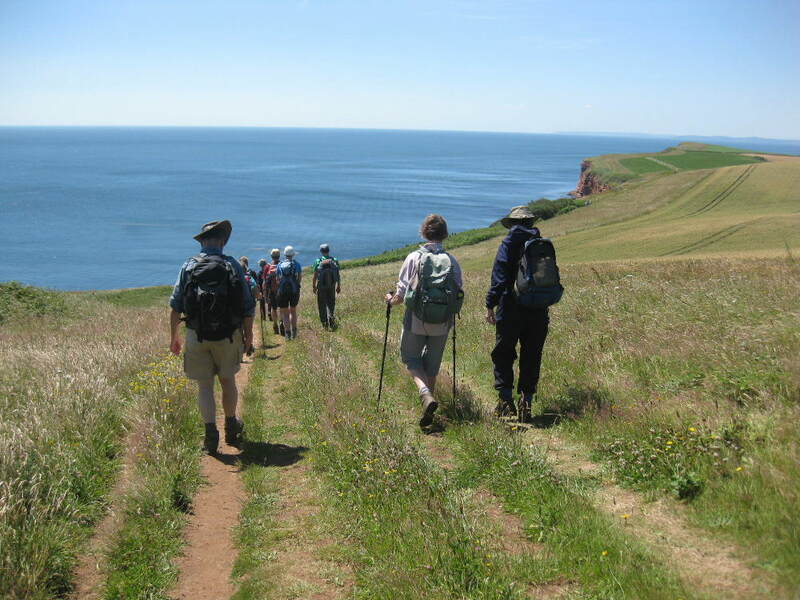 Saturday’s walk was a 12 miles circuit from Swanage taking in Durlston Castle and a walk through millions of years – we can’t find a link for this so you will just have to discover this for yourselves. Behind Durlston Castle we looked at the Globe and then walked on along the coast path past Tilly Whim caves, the old lighthouse and cottages. At Dancing Ledge we could see groups coasteering. We paused for lunch by yet more caves at Winspit and then continued to the radar memorial at St Aldhelms Head. Walking past the coastwatch point we visited St Aldhelm’s Chapel. It was then a swift cross-country walk along the Priest’s Way via Worth Matravers back to Swanage with more lovely views. The next day we drove inland to the Spread Eagle Hill car park near Compton Abbas airfield. We enjoyed the wonderful views from the trig point at Melbury Beacon and then headed back towards Compton Abbas airfield. Pausing to phone the airfield to let them know we were going to cross the airfield on the public footpath we then walked through a mixture of woodland and open fields to Ashmore. After a brief pause for lunch we walked along the Wessex Ridgeway to walk northwest through woodland across to Fontmell Down, linking in to that nature reserve’s circular walk. There were many orchids to be seen along the trail. After returning to the car park we made the short journey to Compton Abbas airfield for tea and cake before returning homewards. In light drizzle four walkers set off from the car park in Holford walking up Holford Combe, and Lady’s Combe then south east on the edge of the wood with lovely views over the Bristol Channel. Next we walked downhill into Ram’s Combe for a coffee stop and then up Quantock Combe to Quantock Farm. Unfortunately the cloud was down and it was also raining. 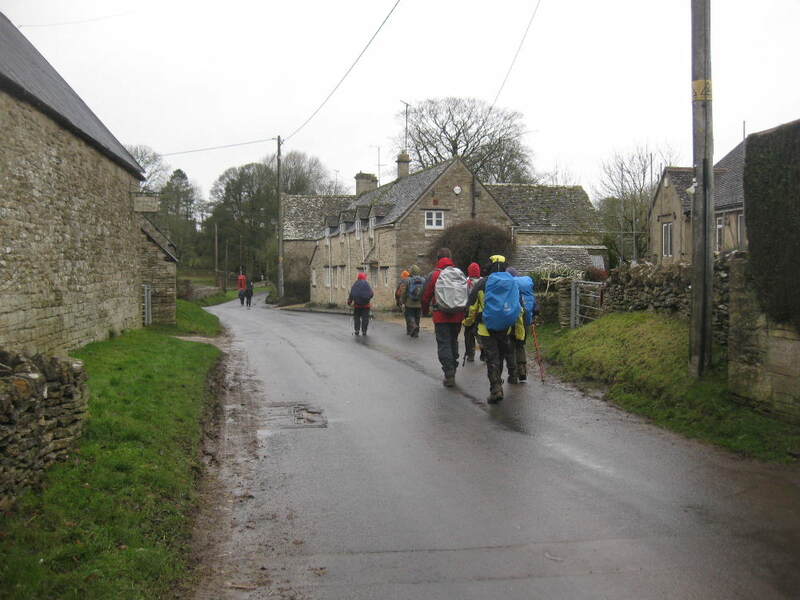 As it was too wet for a lunch stop, at Halsway Post we decided to descend into Holford via Somerton Combe. The rain eased as we approached Holford Village Bowling Green so we ate lunch there before driving home. Four crystal clear, if cold, days in the Lake District. Retracing the final stage from the night before, we headed towards Ambleside via Skelghyll Lane (beware Charity Mountain Bikers on the first section!) with a short rest on Jenkin Crag (with wonderful views out over Windermere), before a quick dash into the excellent sandwich shop(s) in Ambleside. The climb north out of Ambleside towards High Sweden Bridge was broken by a well-deserved coffee-stop, supplemented by our recent purchases. Well refreshed, we continued to High Sweden Bridge, which we crossed and then climbed up onto the ridge at Sweden Crag, to follow the ridge past Low Pike (a good spot for lunch), High Pike, Dove Crag, Hart Crag (more apples and boiled sweets), to reach the summit of Fairfield. The descent route via great Rigg and Arthur Stone brought us quickly down to Grasmere and into Butharlyp Howe YH. A slight variation on the classic Fairfield Round from Ambleside - in that we started at Troutbeck rather than Ambleside, and finished in Grasmere rather than Ambleside ! 20km, 1200m ascent (12 miles, 4,000' ascent). Sunday's walk took us back towards Fairfield, via Little Tongue (with coffee at Hause Rigg), to Hause Gap where the party split: some opting for the lower level route past Grisedale Tarn, to follow the valley straight back to Patterdale - while the others climbed back up to Fairfield and then on towards Hart Crag (stopping only to admire the views, and eat lunch in a sheltered spot just before Hart Crag). After lunch we completed the final drop and climb to Hart Crag before locating the path down - via Hartsop Above How - giving us tantalising glimpses of St Sundays Crag through the cloud. More sweets and apples were consumed part-way along the ridge, before we dropped down into the valley to join the A592 at Deepdale Bridge. We were able to avoid the first short section along the road, but the final section was along the road - fortunately with pavements most of the way. 14km, 950m ascent (9 miles, 3,000' ascent). A wonderful long weekend, enjoyed by all. 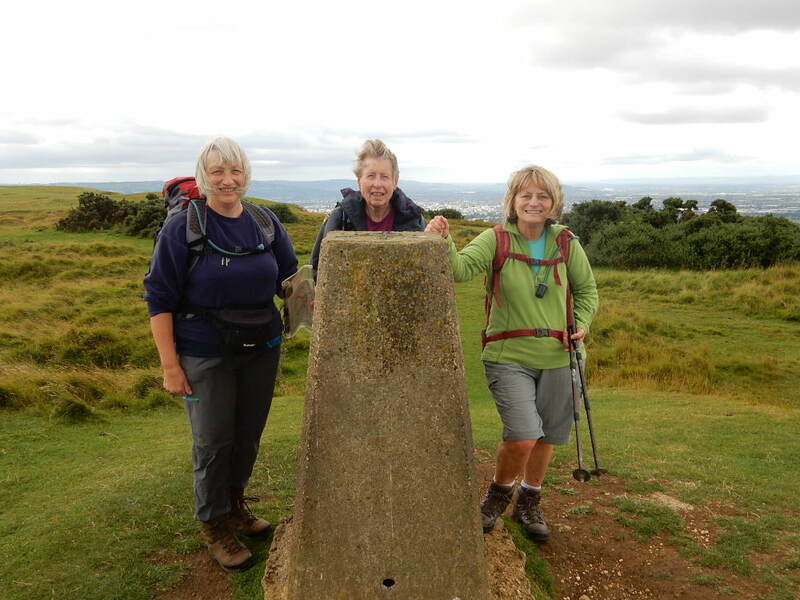 Our walk started on a chilly, sunny spring day with a gentle climb up to Little Solsbury Hill to admire the views, bag the trig point and read the information about the history of this site from 300BC to 100BC. We then continued in challenging muddy conditions to a coffee stop above Northend. A climb to Banner Down and a second trig point was followed by a descent to the Limestone Link. We lunched on the Limestone Link overlooking St Catherine’s Court, former residence of actress Jane Seymour. After lunch we left the Limestone Link and walked past Monkswood Reservoir and on across Charmy Down Airfield to descend to Chilcombe Bottom. We stopped for an apple by Wessex Water’s former reservoir and finished our walk a mile later. This 12 mile walk did include a lot of mud so we were quite tired at the end. Our two walks in the Eastern Carneddau both started from the remote car park at SH721715 (accessed from Tal-y-bont). On Saturday, a linear walk over Foel Lwyd to the trig point on Tal y Fan (a surprisingly sheltered spot, with lovely views for a well-deserved coffee stop). A gentle downhill yomp on a very faint path then brought us to the Druid's (Stone) circle - where we had lunch. 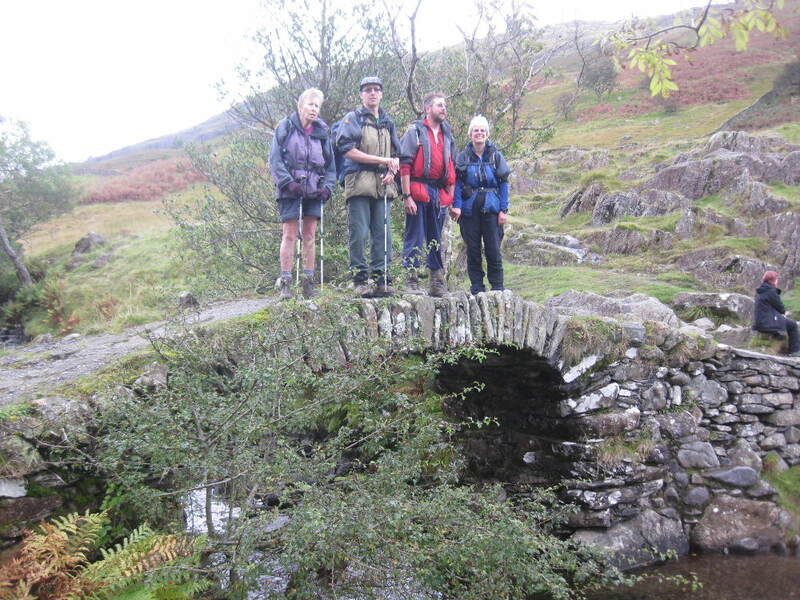 After lunch we joined the North Wales Path which we followed (after a slight detour was brought to an abrupt halt by a 'raging torrent' of a stream) - taking advantage of the well-positioned footbridge over the aforementioned stream! The more active members of the party enjoyed the steep climb up Alltwen, while the remainder of the group took the direct route to Conwy Mountain - where we regrouped for the gradual descent into Conwy with continually improving views of the castle. 16km, 500m ascent, 950m descent. Sunday's walk started with a section of road walking back over the picturesque bridge and then up a track to cross a leat before following the edge of the open-access area (where the visible path wasn't always where it was marked on the map, and some of the styles were hard to spot). Coffee was taken at the first available bench. Suitably refreshed, we then began to climb to the summit of Pen y Castell before dropping down to the north to find shelter for lunch. After lunch, we climbed Foel Lwyd (a different one), pausing only for breath and an abortive search for the wreckage of De Havilland Mosquito HX862 - before reaching the summit of Drum. We then followed the fence line back to the roman road, and down to the car park. Starting at Abergavenny Leisure Centre we climbed steadily through the houses to reach St Mary’s Vale. We then climbed through the trees to reach the minor road that serves the Mynydd Llanwenarth car park. From the hillside above the car park we got the first view of the summit of Sugar Loaf. The path rises steeply to the summit trig point. There was a bitter wind blowing at the summit so we stayed only briefly to look at the great views and take a few photographs before descending to the head of cwm and gaining the Deri ridge. From the ridge we made our way down through the woodland to Sunny Vale coming to outskirts of Abergavenny and once more to the Leisure Centre. Setting out from The Park at Tidenham on a bright but chilly morning, the group soon arrived at a trig point which was level with the car park - quite a novelty! Continuing across scrubland we headed for Miss Graces Lane which we followed for a short distance before taking a footpath to the B4228. After crossing, we entered another area of scrubland known as Poor's Allotment, which provided us with good views of the River Severn. Shoftly afterwards, we joined the Gloucestershire Way and followed this through various wooded areas and several fields. Leaving the Gloucestershire Way we made our way up through Woolaston Wood and found a sunny clearing in time for coffee. After coffee break we headed uphill on a good forest track towards Little Meend where we crossed back over the B4228. Proceeding along the edge of Oakhill Wood we arrived at Beech Knoll and briefly on to open countryside before the final stretch of very overgrown woodland. Emerging from the wood we came upon a very pretty tree which was just breaking into blossom. From here we continued downhill and across several fields with magnificent views of the Forest of Dean and the Wye Valley. We subsequently picked up Offa's Dyke Path which we followed down to Brockweir. We passed several mountain bikers who, we decided, were involved with some sort of time trials rushing up and down the hill - not for us we decided. At Brockweir we took a short detour to look at a Moravian church alongside the River Wye before crossing the river bridge and joining a footpath taking us along to the Old Station at Tintern. There were some very interesting wood carvings and metal workings along the path which promoted much observation and discussion amongst the group. The café at the station was closed but we made good use of the picnic tables for our lunch stop. We continued along through the old station which houses a museum and information centre in a railway carriage. Unfortunately, this was also closed as out of season. Further along we found very interesting carvings of past members of royalty and ancient warriors. Alongside these were very informative legend boards which we spent some time reading. On we sped, along the River Wye, which was so muddy it was much like skating so we were quite pleased to reach Tintern and firmer ground. Here we crossed back over the river via an old railway bridge and continued along until we came to the climb up to the Devil's Pulpit. This completed, we afforded ourselves a much needed break to admire the view of the Abbey, Tintern, Wye Valley and Rob! Finally making our way back across some fields, through scrubland and past the trig point again, we arrived back at the cars. We drove through mist and on and off rain to the start point of our walk in LLangynidr. We climbed steadily upwards through fields of horses, wonky stiles and rutted lanes until we reached the snow line at about 380 metres. Here we decided to have an early coffee stop where we could sit on grass in between the bushes. The route then led on to a short stretch of road before going through the disused quarry at Blaen Onneu. We knew we needed to go across country to find the trig point at 541 metres but with the mist down and the snow obliterating all helpful sheep tracks we were thankful to eventually see it rising out of the fog. We then followed other footprints along the path through the snow and mud to reach Chartist Cave. This provided an ideal spot for lunch inside out of the weather. The afternoon had us ploughing through pathless heather covered with snow on a compass bearing in the fog. Not an easy task ! Our objective, a millennium stone set in an angle of walls, was achieved at last. We continued downwards through the renovations at Pantllwyd, through fields and the churchyard, arriving back at the cars in the gathering gloom. We had made full use of the daylight hours.